So I’m going to Italy, for a week, to visit a friend from the Camino. It’s been a bit… confusing? odd? difficult?… to try to get to know someone who lives in another country. 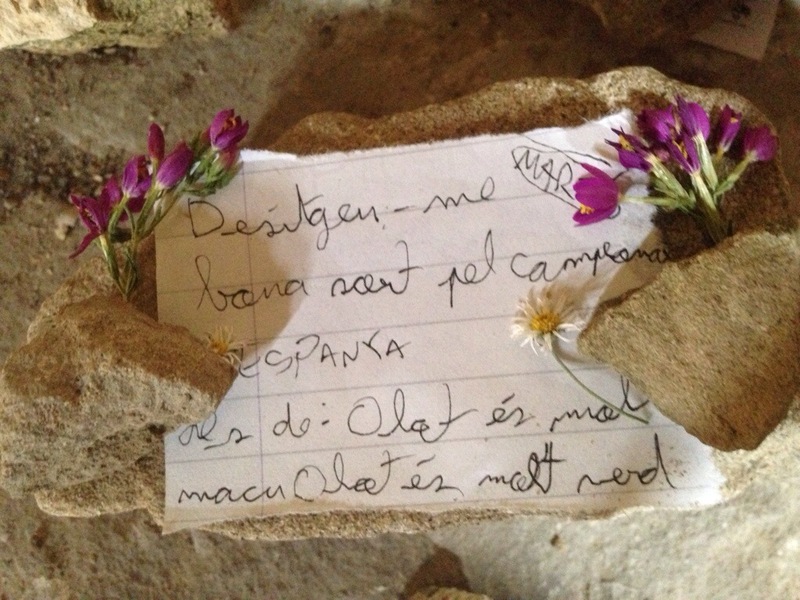 There are a million reasons why it would be simpler to have left this on the Camino, to have left it at a brief connection. And maybe this will only be a brief connection: a conversation on the Camino, a visit to the States, a visit to Italy. And then 2015 will come around and it will be on to new things. But for now, I’m going to Italy. Because even if it’s not simple and even if I can’t see a clear image of where this is going, not going would mean ignoring so many of the lessons I learned on the Camino. It would be passing up a chance to… well… live in the moment. To go with a feeling, to follow my gut which is saying, “Go to Italy! !” So I’m going. 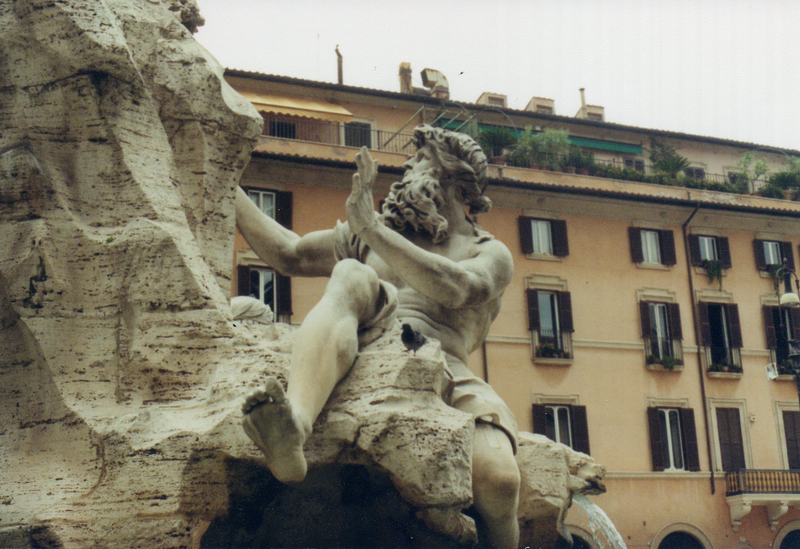 I’ve been to Italy twice before, both times to Rome, when I was 20 and 23. This time I’ll be in the north of the country; I want to spend at least a day in Florence, and I know that I’ll get to see Venice (when I told him that I’d be coming to visit, his first question was: “Would it be okay with you if we spend New Year’s Eve in Venice?” How could the answer to this question ever not be a ‘yes’??). And as an added bonus, I have a long layover in Copenhagen on my way home (it will be cold and I think I’ll have a total of one hour of sunlight while I’m there, but it’s still a new place!). I’m shaking my head a bit about all of this, because in some ways I’m not sure how it happened. My life here feels mostly the same as it’s always been- same job, same apartment- and I’ve been feeling like I need something to change. This trip isn’t about changing anything, and yet, when I think about where I was last year at this time, it feels incredible to have this opportunity at all. A year ago, I probably never would have imagined that I could ever get myself to a place where I’d be doing this: flying off to Italy to meet up with a friend I’d met in the summer while walking across Spain. I think this is going to be a good way to end the year, and a wonderful way to begin 2015. Standing in a crowded square in Venice, a place I’ve always wanted to travel to. Imagining the possibilities of the year ahead. Knowing that I can take myself anywhere. This afternoon I found myself walking (hiking?) down an empty, paved road through a wooded park. It was 4pm and the day was turning dusky, light rain drops were falling and I could see my breathe. I walked quickly, my pack a comfortable weight against the small of my back, the hood of my raincoat pulled across the top of my head so I could stay dry. I took a few walks in the cold, a few walks in the rain, in my pre-Camino training days. 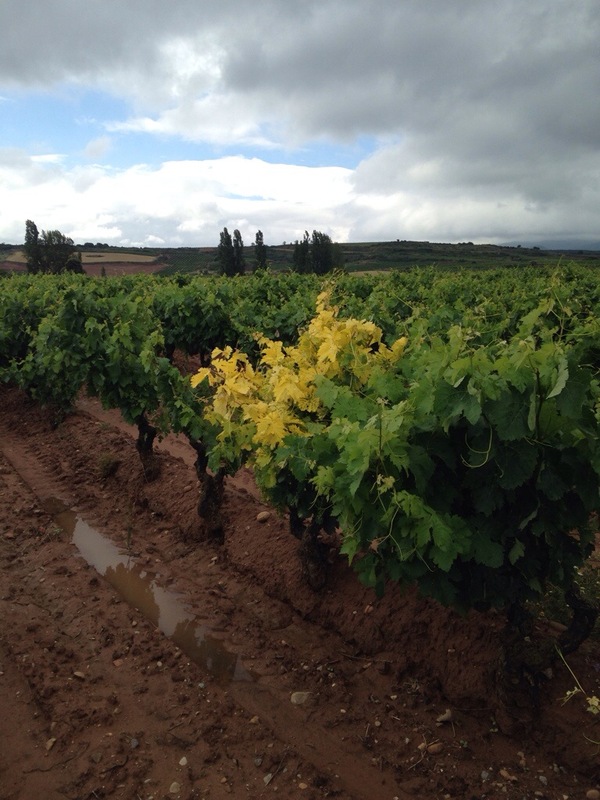 Back then, it felt like every walk mattered (and maybe each one did; only a couple tiny blisters and minimal physical pain on my walk across Spain), but why am I walking in the cold, wet weather now? The answer you might want to hear is that I’m training for another Camino, but that’s not it (although, I reason that if I never really stop walking with my pack, then I’ll never fall entirely out of “Camino shape”). I’m walking because it’s still the thing I want to do most. I don’t think a day has gone by since I returned from the Camino that I haven’t wanted to be outside, walking. Five bags full of stuff for one day. Compare that to my summer: five weeks of walking and only one bag. What happened to the simplicity? And what happened to my time? A few miles into my drive to work I realized that I had left my hiking shoes in my apartment (I may have left behind multiple things on the Camino, but I never started a day without my shoes). I would be late for work if I turned around to get the shoes- I didn’t have time, not even 10 minutes. There wouldn’t be time to return to my apartment after work, either. Some days I’m lucky enough to finish work by 3:00, which means if I leave on time and don’t hit traffic, I can make it to my state park and fit in a 75 minute hike before the sun sets. But everything has to be planned and scheduled and running on time. Luckily, I keep piles of shoes in my car (don’t ask me why), and I routed around to find my first pair of Camino shoes, bought in the spring- the ones that caused me a few tears and a few blisters. I’d always meant to return them and eventually I will, but in the meantime, they served as the perfect pair of backup hiking shoes. So I hiked- or walked- and it was great. The park was empty and I like it like that. It was cold but not so cold that I couldn’t warm up after walking a mile or so. 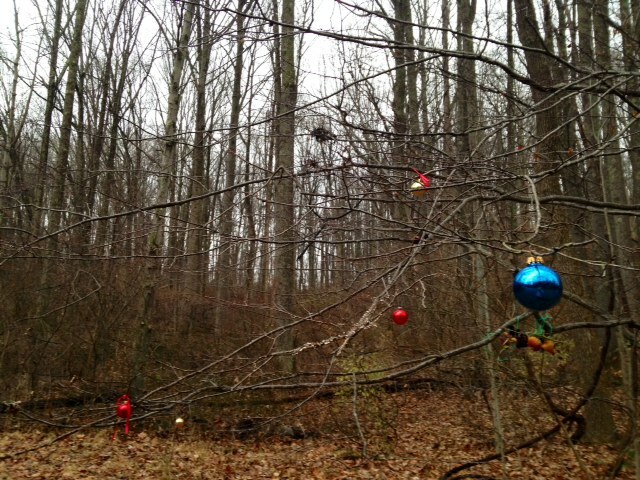 I passed Christmas ornaments hanging from the bare branches of a tree, and I paused to take a photo. It was good to go on that walk, but it didn’t fill me like my Camino walks filled me. A month ago I was lucky enough to meet up in New York with a few of my Camino friends. 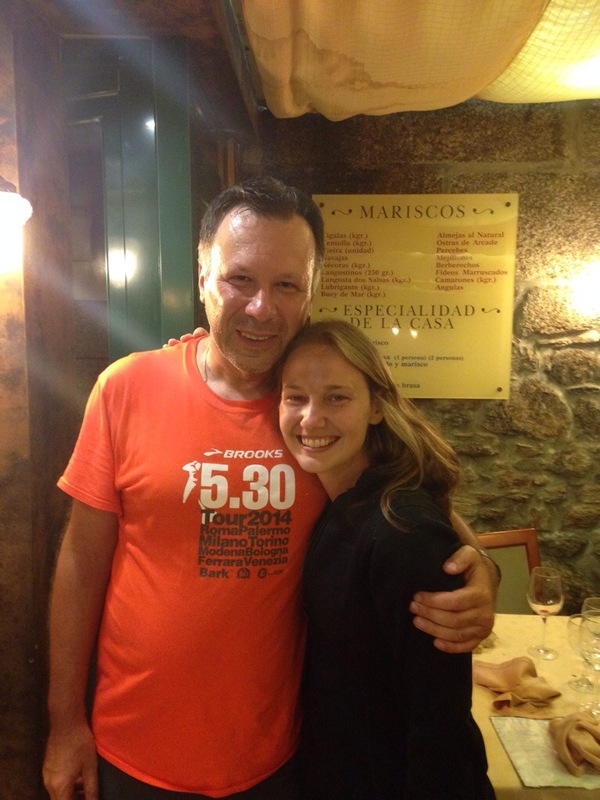 I had a great conversation with Saskia, a high school teacher in Boston (this was fitting, as she was someone I’d had a very needed and timely conversation with on the Camino, as well). We talked about the frustration of returning home to regular life after an incredible and transformative experience. 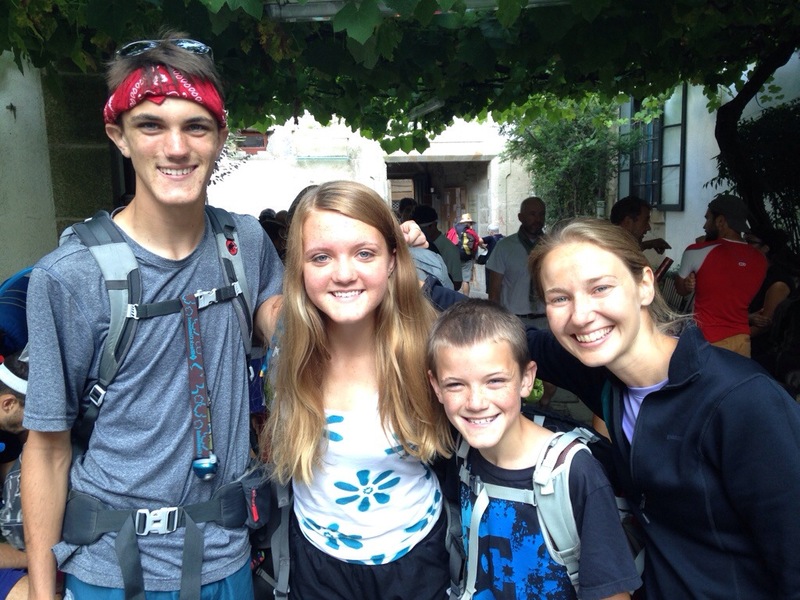 Others are making changes: for these Camino friends, their walk this summer marked a large transition in their lives, and I watch them enviously. Now, they are full of energy, a similar kind of energy that we all felt on the Camino, an energy that I’m afraid of losing. I thought about this on my hike today, how I need to steal small moments of my day in order to hunt down those energizing feelings. There are days when I struggle to find them at all, days that are too cluttered with other stuff, or when there is no time. I’m not sure where, exactly, this post is going. I guess it’s a not very clear way of saying that I’m still working to find my direction. I’m still walking to find my direction. 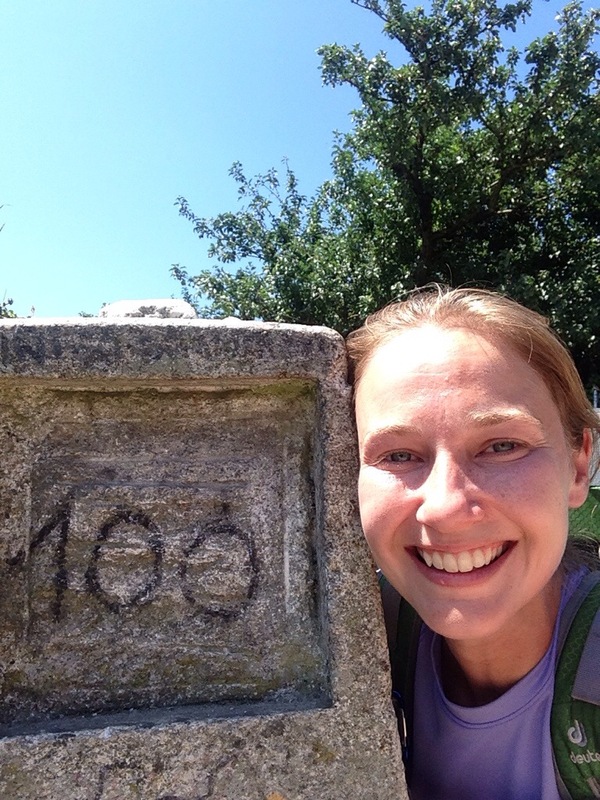 I know that the Camino changed some things for me, and I’m a little impatient while I’m in the in between: feeling in my gut that I need to make a change, but uncertain of a hundred different things. Not changing yet, wondering what my life will look like in a year, wondering how I will get from here to there. So in the meantime, while I work to figure it all out, I’ll keep walking. It’s a late afternoon, early fall October day, 65 degrees of cloudless skies and warm sunshine. I’m sitting at a picnic table in a local park, a cup of Starbuck’s carmel apple cider within arms reach. I’ve got my “Camino writing setup” here: wireless bluetooth keyboard connected to my iPhone. I haven’t used this keyboard since the Camino, and my fingers are getting used to typing on it, again. It’s fall in Pennsylvania, and these might be the last days of sitting outside in the sunshine. The last days until next year, that is. 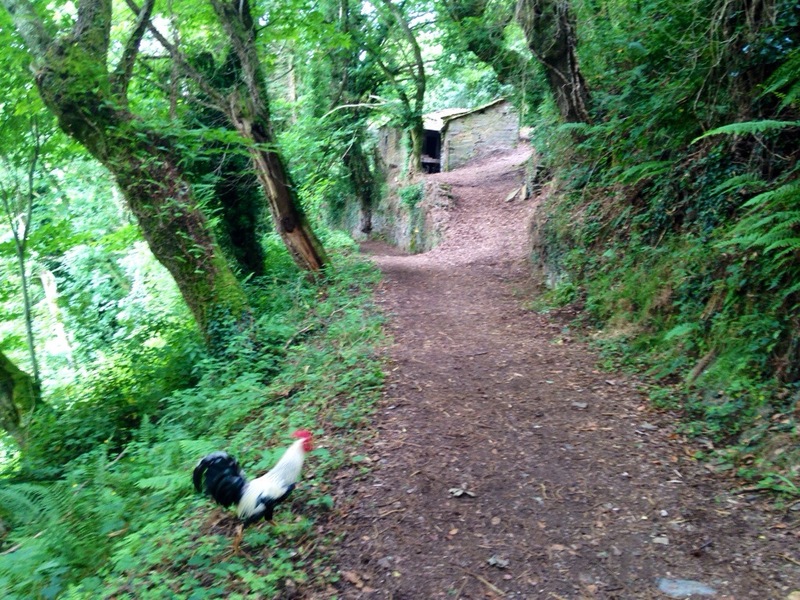 I can’t remember what time I woke up and started to walk on my last Camino day. Early, I think. Even though we didn’t have far to go- only 11 km to Finisterre- there was a lot I wanted to do with the day. I wanted the early start not only to keep up with my routine of the previous 5 weeks, but also to enjoy as much as I could. To soak it all up, because I didn’t know when, if ever, I would be back. Whoops. We’d been given a key when we checked in the day before, and I’d been in charge of it. We’d never needed to use it and I’m still not sure why we had it, but I’d forgotten all about it. Sheepishly I routed around in my pack and placed the key in his palm. “Gracias,” he growled, and walked back to his car. The night before, Sonal, Emma and I had been convinced that he knew we’d taken wine glasses to drink by the water. 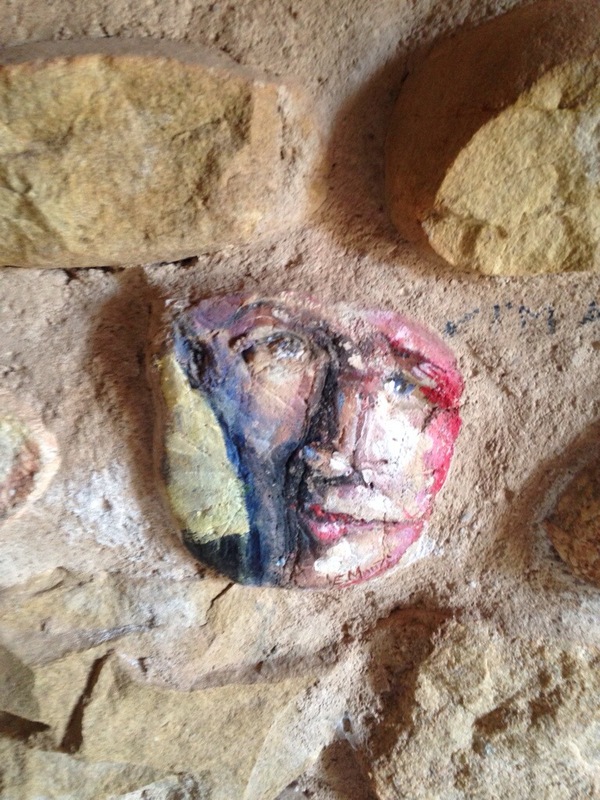 It seemed as if he’d been waiting for us when we’d gotten back to the albergue, watching us with a suspicious eye. Giggling, we left the town of Corcubión, climbing up a steep, narrow track, through tall trees. We walked along a road for awhile, then noticed a small path leading down to some sand. Taking a detour we explored a tiny, private beach, where the blue-green water lapped onto the shore, where I found smooth pieces of emerald sea glass. We headed back to the road, following the Camino onto a path that hugged the side of a hill, leading us on a high route that paralleled the water. Parts of this walk had great blackberry bushes lining us on either side, and we stopped every few steps to pick the ripest berries, their juice dripping down our fingers. Closer now to Finisterre, we talked about stopping again for coffee if we passed a cafe. About 2km from Finisterre we ran into Emma, who was sitting on a stone wall on the side of the Camino, just before a beach. Just ahead was a bar that overlooked the ocean. We grabbed seats outside and drank our cafe con leches and ate our tostada, and waived Mo-mo and Silka over when we saw them passing. When we finished we took off our hiking shoes and our socks, and walked down to the sand. The beach would take us the final two kilometers into Finisterre, and I couldn’t imagine a better way of finishing the walk: in my bare feet, walking next to the ocean. The day had become increasingly cloudy, and as we posed for photos, standing on the sand with our packs and big smiles, we worried about the chances of the day clearing up. It’s tradition for pilgrims to head to the lighthouse once arriving in Finisterre, and camp out on the rocks to watch the sunset. “I think we’re going to see a sunset,” I said. The others nodded. We finished our walk on the beach, wiping the sand off our feet and putting on flip flops, and then walked up to the road. 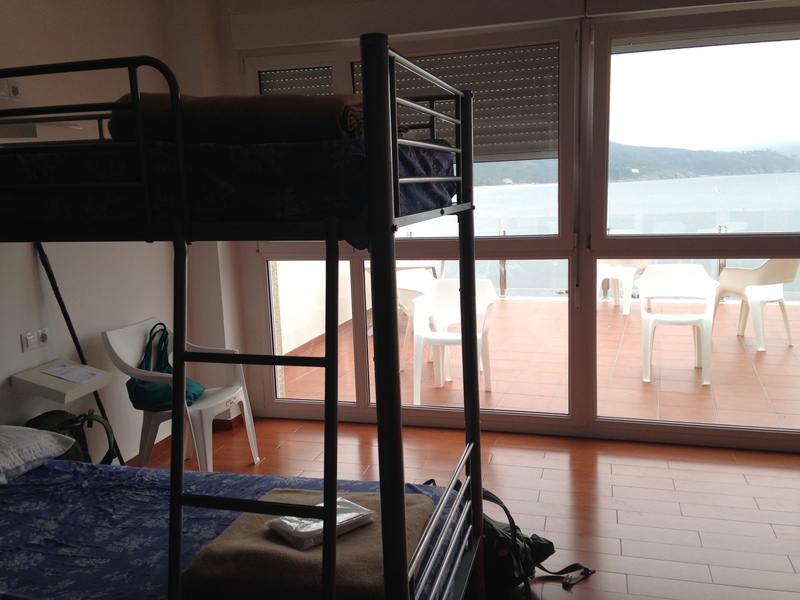 All at once, I remembered that I had a note in my phone about a place to stay in Finisterre. I’d read about it on a blog months before, and I’d copied the information down, stored it in my phone, and had completely forgotten about it until that moment. I don’t know what made me remember- Camino magic? Albergue do Mar was the name, and we walked up the road, rounded a corner, and there it was, looming in front of us. Three stories, big balconies, right next to the ocean. We walked in, doubtful about the chances of there being any beds left. We were early- it was only 11am- but this was the kind of place that filled up fast. We asked about beds and what do you know? There were four left. “We’ll take three of them,” I said with a smile. We were lead upstairs and into a room and given the two sets of bunk beds closest to the floor-to-ceiling windows that had a view that was nothing but ocean. This time, for the last time, I requested the top bunk. After spreading out my sleeping bag and climbing up the ladder, I laid on the bed and stared straight out onto the ocean. A 10 euro view. Amazing. We changed into bathing suits, thinking we might go to the beach if the sun would ever come out, and then walked into town. We found a bustling seaside restaurant and sat down to one of the best meals I’d had in Spain: a menu del dia lunch of pulpo, fresh seafood paella, ice cream, more baskets of bread than I can count, and two bottles of wine. 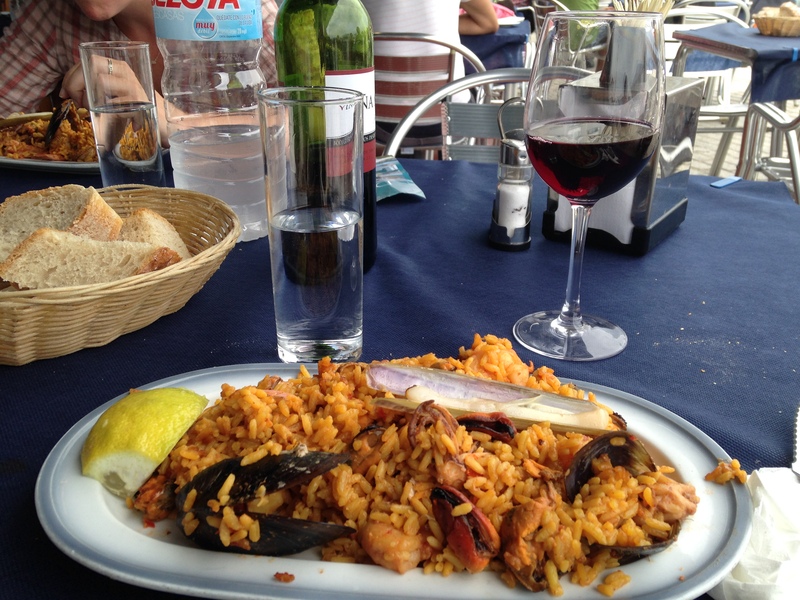 We were at that table for at least two hours- I think we waited for our paella for nearly an hour- but it was perfect. 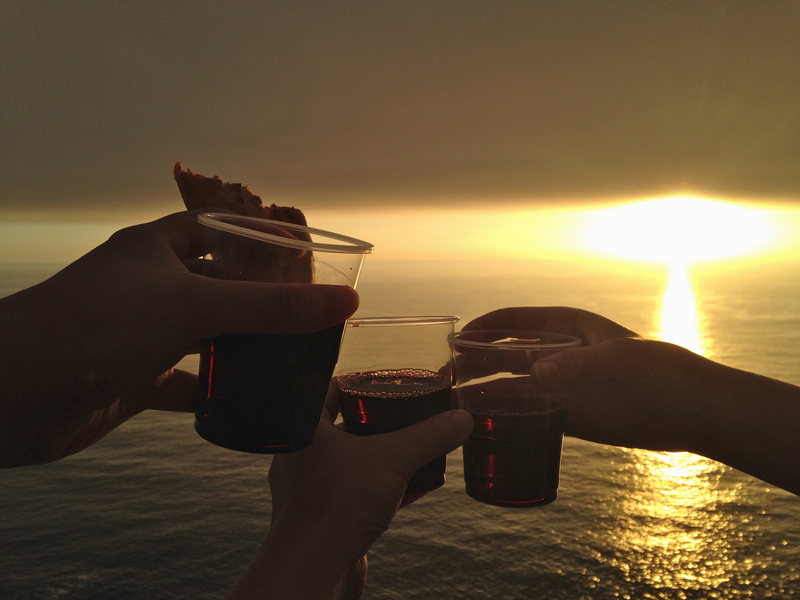 This was the end, we had walked to Finisterre, the ‘end of the world’, and there was nothing more that I wanted than to sit there with my legs stretched out, sipping a glass of wine, and talking to my friends. And then, just as we were paying the bill, Emma looked up at the sky. “I see blue. I see blue! The sky is clearing! 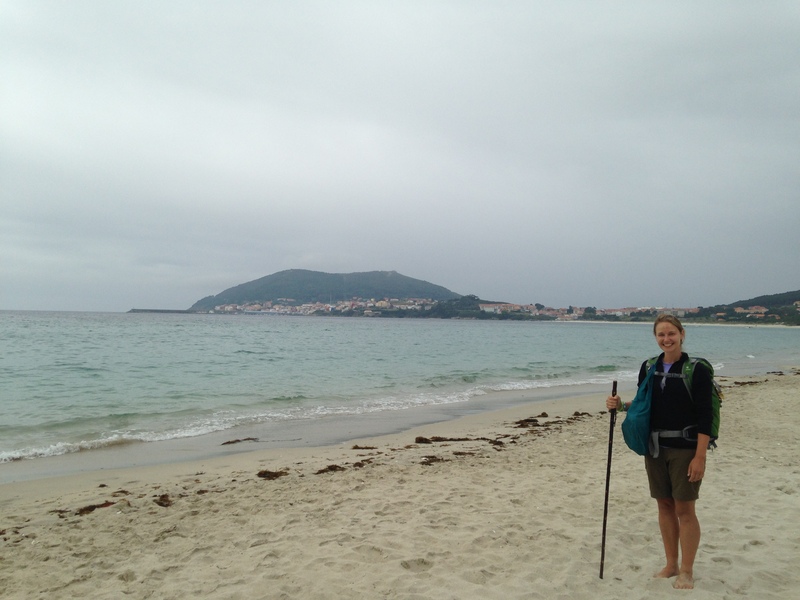 !” We immediately headed out and walked 20 minutes to one of Finisterre’s beaches, the clouds moving out as we moved towards the ocean. And five minutes away from the beach, the sun came out for the first time that day. We cheered, and when we got down to the beach, we sat on the sand and let the warmth of the sun wash over us. “This might be just what I need to be able to go into the ocean.” I walked down to the water in my bathing suit, not convinced that I would make it in. The day, despite the sun, was cool, and the water even cooler. But standing at the water’s edge, feeling the sun on me and looking out to the expanse of the ocean, I knew I had to do it. So before I could talk myself out of it, I jogged into the water, to my knees, to my waist, and then I dove under. I’ve always loved the ocean but this was about something more. When I dove under and let my feet come off of the ground, it meant that I had walked until I literally couldn’t walk any further. It was something I didn’t realize I needed to do until the day before, when I saw the ocean. Not only was I walking to the ocean, but I was going to walk into the ocean. 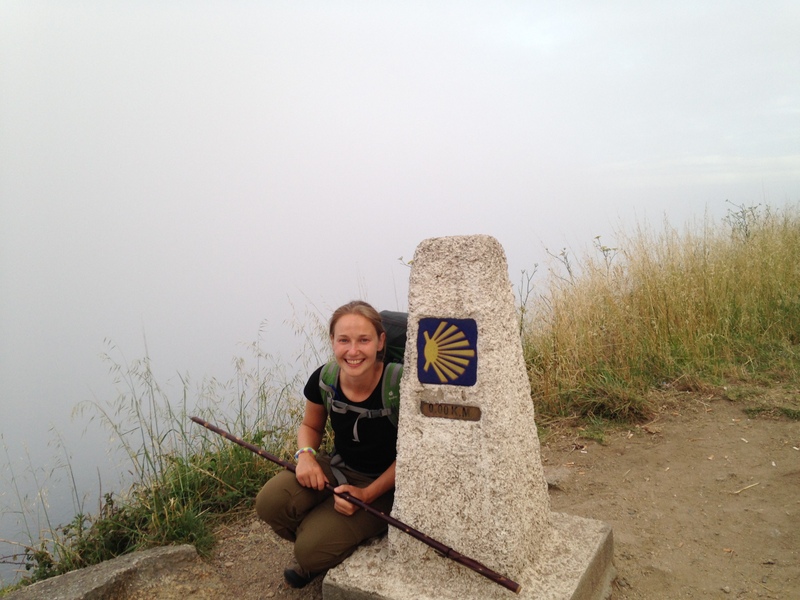 My final Camino steps. I popped out of the water, sputtering. Sonal and Emma were on the shoreline cheering, and then just as quickly as I went into the water, I ran back out. Too cold! I dried myself off as best as I could with my super absorbant, super small REI towel that didn’t even fit around my waist, and then sat on the sand and watched as Emma swam in the water. And then, as if timed just for us, clouds rolled back in and the sun disappeared. We headed back to the albergue and showered. While the others rested I took my journal and headed out to a bar around the corner, where I ordered a cafe cortado (an espresso shot with a dollop of milk, it was my first of the trip and I think it will be my afternoon coffee drink if I ever make it back to Spain), sat outside, and wrote all of my thoughts about the last day. I’d told the others I would meet them back at the albergue at 7:30, and that I would pick up some food that we could take up to the lighthouse. I stopped by a small supermercado, picking up two baguettes, a bar of dark chocolate, a bag of potato chips, three peaches, and two bottles of wine. When I met up with Sonal and Emma they nervously asked about the wine I bought (in only a few days with them I’d earned the reputation of being frugal- why buy a 6 euro bottle of wine when you can get a perfectly good one for 2 euro?). But on this night I splurged: 12 euros for a bottle! I loaded up my pack with all of the food and wine, plus most of my other things. Even though I’d taken my ‘last steps’ when I ran into the ocean, we had another two kilometer walk up to the lighthouse. I still wanted to feel like a pilgrim. So with my walking stick in hand, we set off, climbing on the path that ran alongside the road, walking through fog and mist and thick, heavy clouds. Closer and closer and then we were there, at the 0.00 kilometer marker. We posed for more photos, nothing but thick clouds behind us where there should have been an ocean. The lighthouse was just ahead, and around the corner we’d find the rocks where pilgrims set up to watch the sunset. We walked past the lighthouse, Emma anxiously climbing the stone steps up the side of the rocks. I looked at her face when she got to the top and she was beaming. Sonal and I arrived behind her, and there, out across the ocean, was the sun. It was straddled by thick lines of clouds, but it was there, a band of glowing, orange light spreading out over the water. We settled on the rocks and opened the 12 euro bottle of wine, poured it into small plastic cups and stretched our hands out to toast, everything illuminated by the golden light. We broke our bread and talked about the Camino: about our experiences, the things we learned and the things we would take away from the journey. And then, as the sun began to dip down towards the horizon, we became quiet. 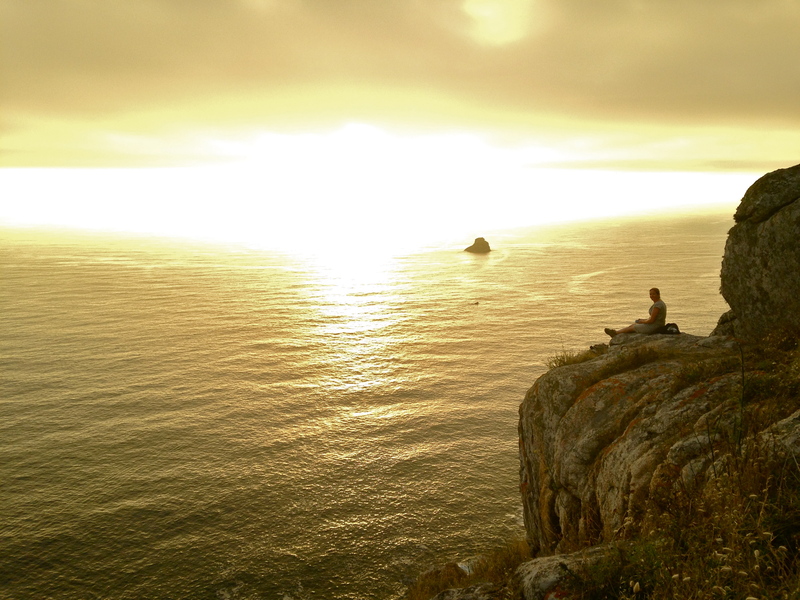 I sat there on the rocky cliff at the edge of the world, watching the sun set over the ocean. Lower and lower and just as the last sliver of sun disappeared, I smiled. Since I’ve been home, I’ve been measuring time by Camino milestones. 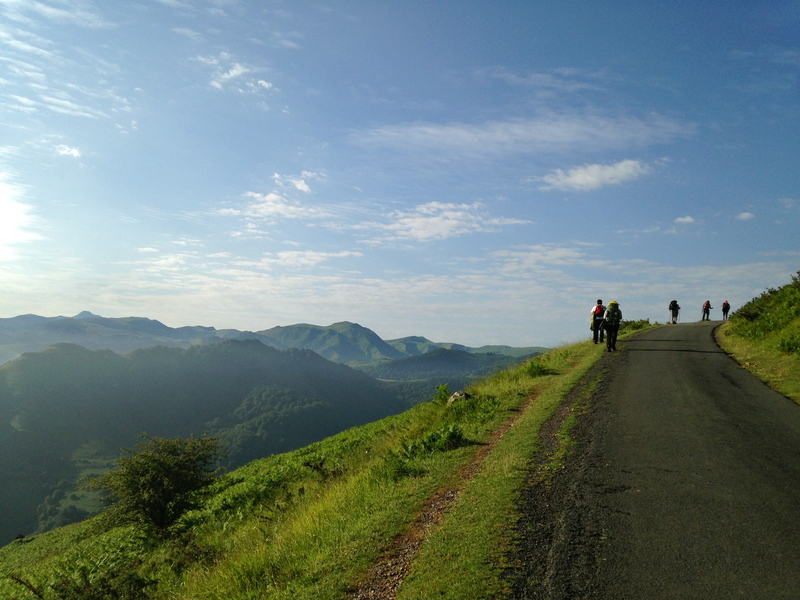 As in: “It’s September 27th… three months ago, I started walking out of St Jean Pied de Port!” and “It’s October 4th, two months ago, I was one day away from Finisterre.” Two months since the end of my Camino? Time is a funny thing. So much living was packed into my 5 weeks on the Camino, and it feels like I’ve done a fraction of that kind of living since I’ve been home. Which makes sense, I suppose, because “real life” isn’t “Camino life”. And yet, my pack sits on the kitchen chair closest to my back door. Ready to go, at all times. I take it with me and wear it when I go out for a hike. I don’t need to wear it, but I like to wear it. The feel of it on my back reminds me of the Camino. And, maybe, part of me doesn’t want to get out of practice. I reason that if I continue to walk, continue to wear the pack, I’ll be ready for another Camino at a moment’s notice. I like to pretend that I could leave for another Camino at any time, even though the reality is that it will take time- maybe a lot of it- before I will go again. 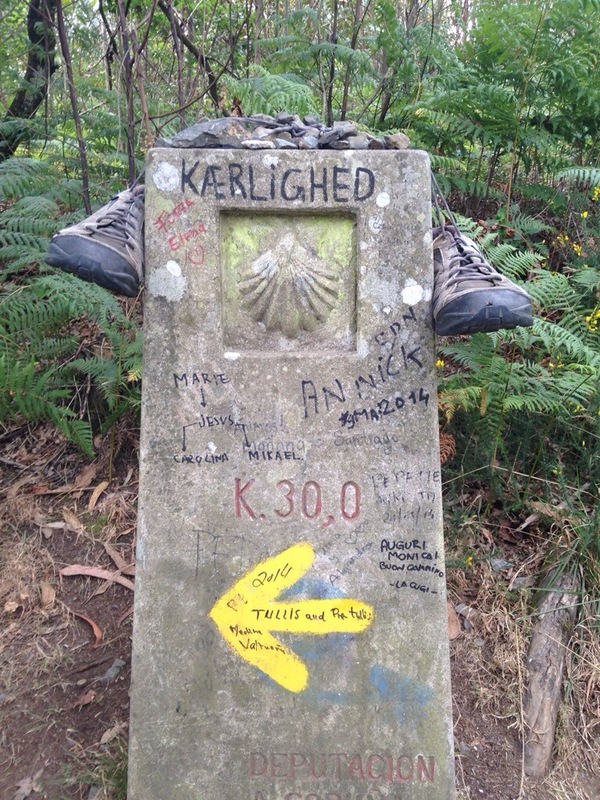 This was a long way of getting around to the real topic of this post, which is, the last days of walking the Camino. I think there’s a part of me that didn’t really want to write about the ending, because it means that I’ve finished writing about the Camino (which isn’t true at all, because so much of the future writing I want to do is about the Camino); but still, putting the ending into words makes it real. 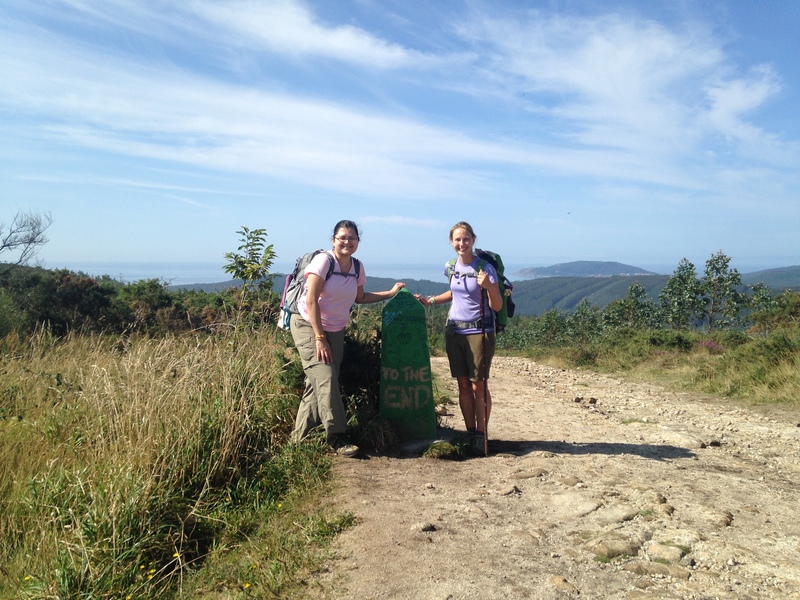 Since my friend from home, Sonal, had joined me just in Santiago, we decided to divide the walk to Finisterre into four days. Most pilgrims do it in three long days, but since we had the time, we split up the last 30+ kilometer day into two smaller days. Which was perfect. On Day 3 we walked from Olveiroa to Cée, which was about 20 km (I think), and it might have been one of my top 5 Camino walking days. It was like the night before had brought the Camino magic back: a good, strong cafe con leche and croissant a few kilometers into the day. A perfectly placed ‘rest stop’: a church with picnic tables under the shade of large trees (Sonal and I were walking and talking about when to take a break, and I think one of us said something along the lines of, “Wouldn’t it be nice if we rounded that corner and there was a place to stop and take a break?” and then a few minutes later we came upon the church and picnic tables). We ran into some of the people we had talked with the night before, further strengthening these ‘late’ Camino friendships. The walk continued, the sun came out, and as we walked, far off in the distance you could see the ocean. It’s hard for me to describe how incredible this was for me. 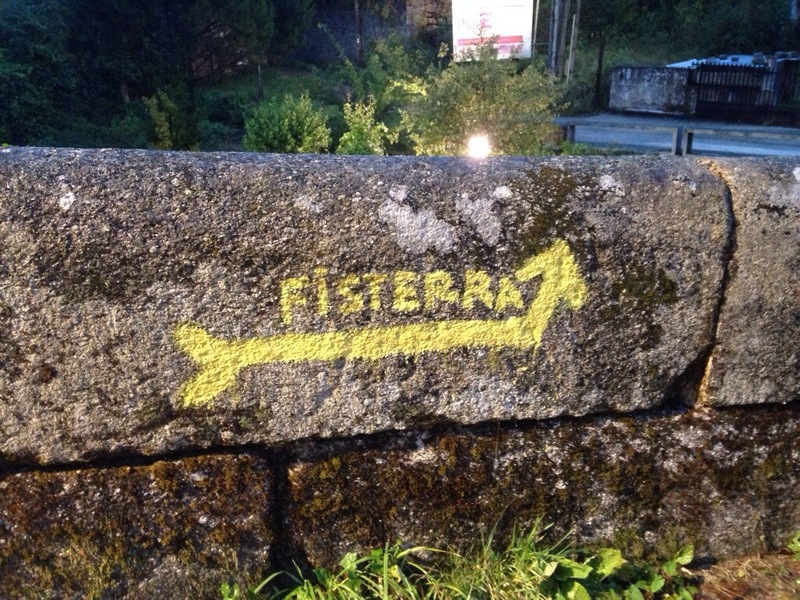 On the Camino, my destination had always been Santiago, but I also knew that I would be making the trip to Finisterre. Seeing that ocean gave me a sense, maybe for the first time, of the distance that I had walked. I’d started in France, and now I was approaching the very western edge of Spain, and the Atlantic ocean. I was walking to the ocean! I had just walked across a country and I was going to walk until I couldn’t walk any further. And it was all so beautiful: the cool air, the sunshine, the green grass and trees, that light blue sky and the darker blue of the water. We stopped to take a photo at a marker that read: ‘To The End’, and then we found a spot nearby, took off our packs, and settled down on the grass to take it all in. Mo-mo, a girl from Japan who we’d met the night before, came over to join us. We stretched our legs out in the sunshine and snacked on cookies and looked towards the ocean. Then we continued walking, that ocean getting closer and closer. 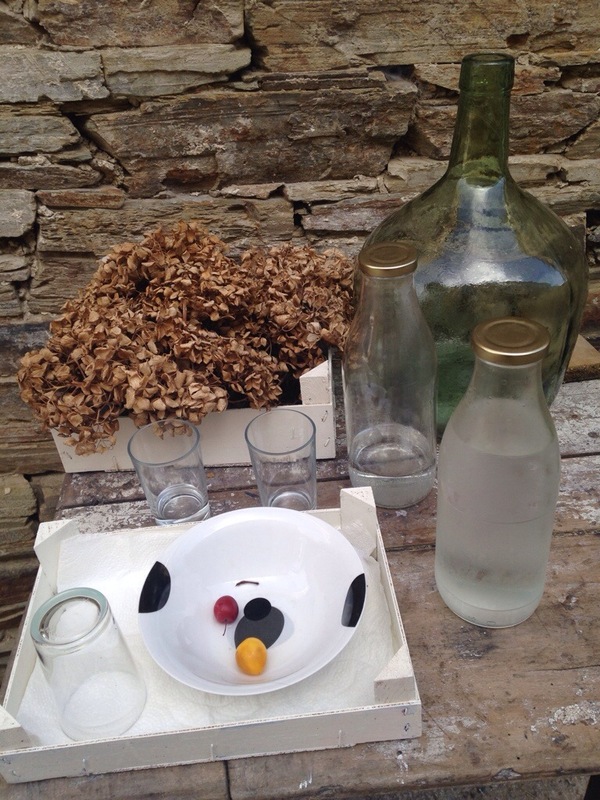 The three of us went to the beach, sat outdoors in a square and drank coffee, made a big salad in the albergue kitchen and later smuggled glasses and our bottle of wine outside to sit on a bench along the water. I ran to a pastry shop we’d seen earlier in the day and arrived 5 minutes before they closed. I came back with Tarta de Santiago- an almond cake famous in Galicia- and we ate pastries and drank wine and looked over the water as the sky darkened. What a great day. But the last day was even better. Stay tuned. I’d thought that my Camino had ended in Santiago. 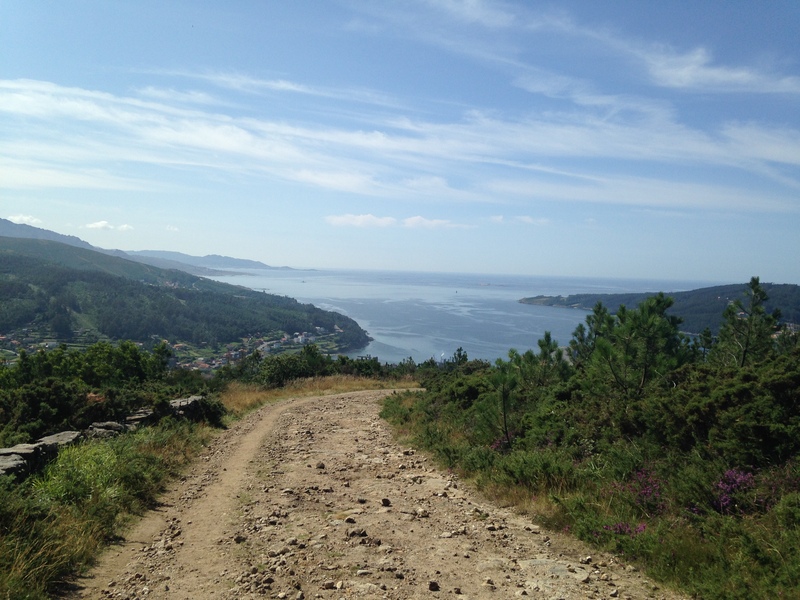 I was continuing on to Finisterre with a friend, but when I last wrote from ‘the road’, on the first day’s walk out of Santiago, I said that I felt like I was on a long walk to the beach with a friend, and no longer on the Camino. Oh, famous last words. If the Camino could laugh, it was laughing at me then. She thinks I am finished with her? Has she not learned anything on this walk? After that first day, walking from Santiago to Negreira, I felt like it was a sort of ‘in-between’ experience: I was still a pilgrim, and it was a Camino of sorts, but very separate from the journey I had just been on. My pilgrimage was done. But things started to change on the second day. 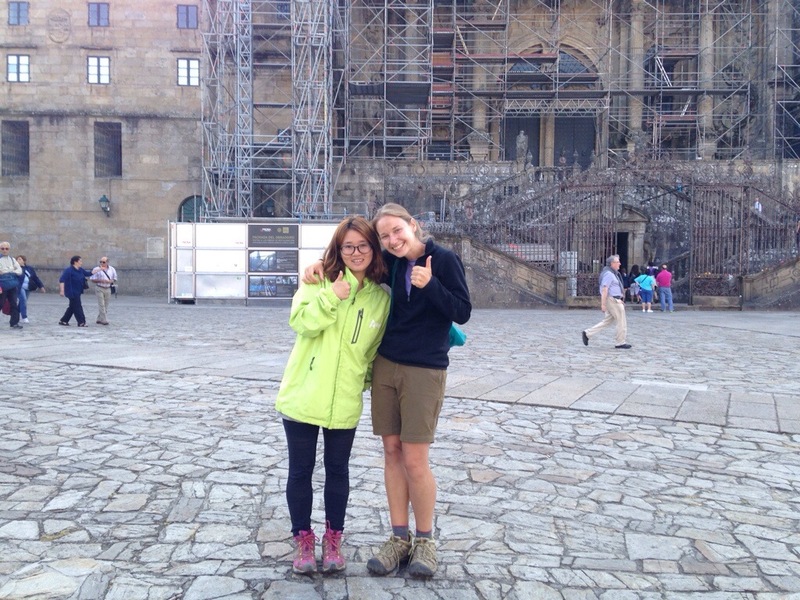 Sonal and I walked to Olveiroa and met so many other pilgrims on the way. It reminded me of the beginning of my Camino, that first week out of St Jean when everyone was new and eager and forming friendships and connections. Maybe it was because we were new to each other, and there weren’t many of us on the road. But suddenly it felt easy, once again, to meet people and to make connections. We stopped at a quirky place for a second breakfast: a family’s home, the patio and grounds opened up for pilgrims to stop and have a drink or a bite to eat. Hammocks were stretched out between trees, picnic tables and multicolored adirondack chairs were scattered across the lawn. 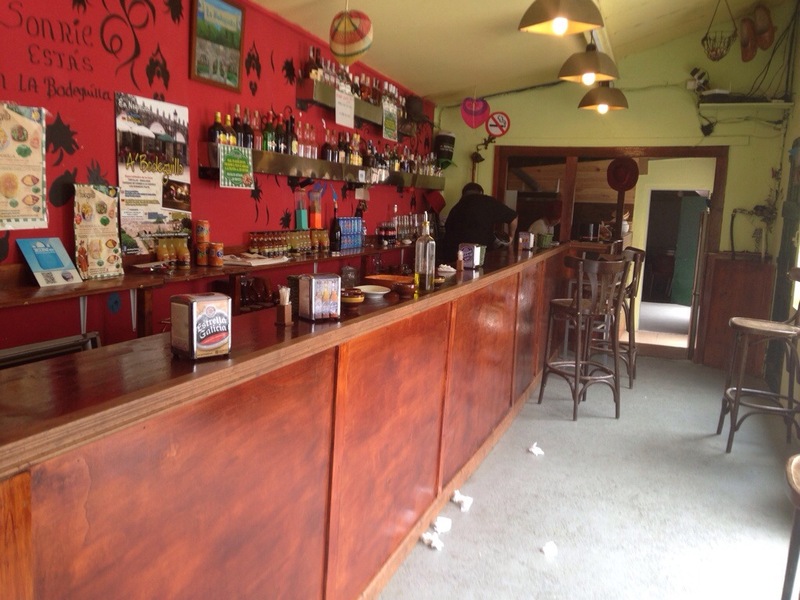 I was excited to find this place: a Camino gem. But just before Sonal and I arrived a group of loud Spanish pilgrims, probably in their early 20’s, had descended on the place. We’d been trying to move away from their group for the past two days but they always seemed to show up wherever we were. We hesitated outside as the Spanish group took over, and just as we decided to leave, an older woman came out of the house. She gestured over, motioning for us to come inside. We did, and settled into cushioned chairs in a quiet room off of the kitchen. 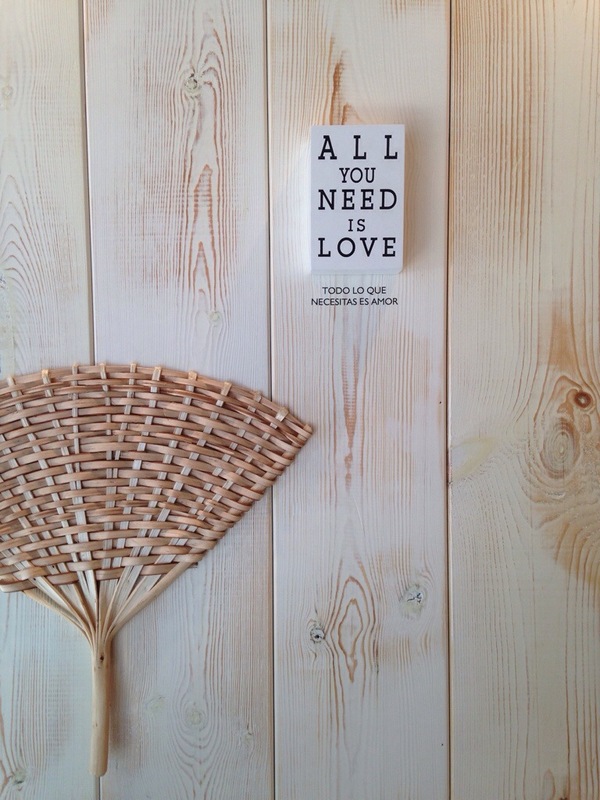 High, wooden beamed ceilings, antique furniture, old musty books, black and white photographs on the walls. I couldn’t figure out what this place was: a family’s home, it seemed, but also an establishment for pilgrims. The mother was bustling around the kitchen, a daughter came out to take our order. Our coffee was served with little orange flavored pastries, and our tortilla was warm and fluffy, with a basket of soft, crusty bread. 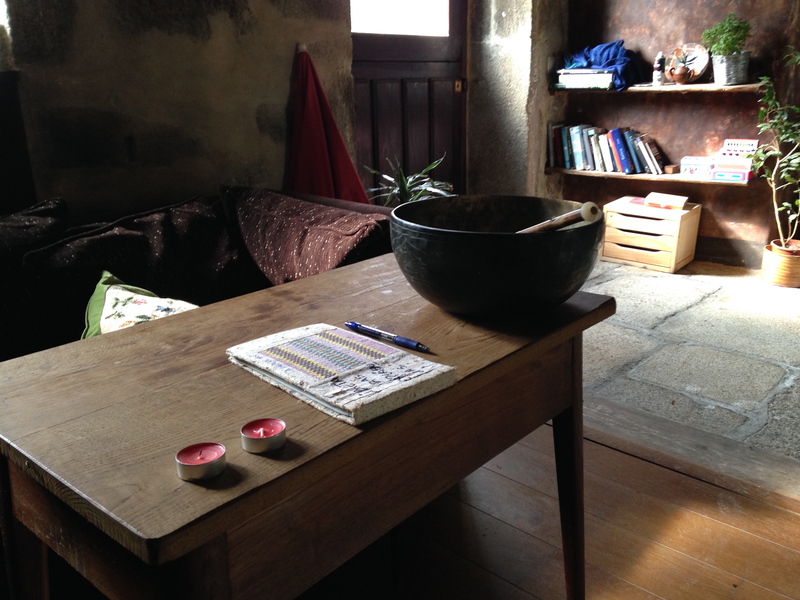 When we finished I signed the guestbook, and I wrote that it was like a small paradise: unexpected and magical. And unexpected and magical are the words that I would use to describe the rest of my experience on the Camino. After a long day’s walk we arrived in Olveiroa, and as I walked through the bar to find the hospitalero to check in for the night, I noticed Richard, a British guy we’d met earlier in the day. I stopped to say hi and sitting with him was someone I’d known from my “real” Camino (as I thought of it at the time). Since I’d started walking to Finisterre nearly a week after arriving in Santiago, all of the people I knew had already moved on, or gone home. 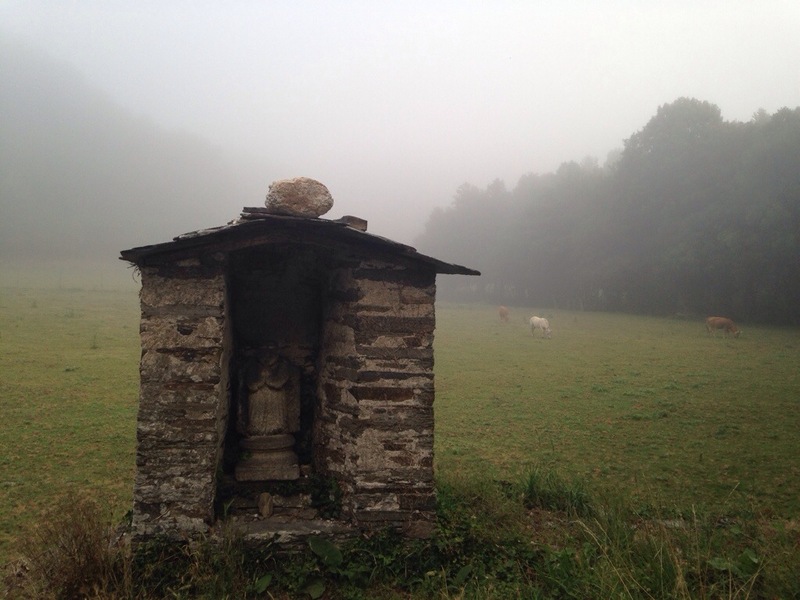 “Everyone from my Camino is gone,” I kept saying. So to run into a familiar face, even if it was someone I didn’t know well, felt a bit mystical. 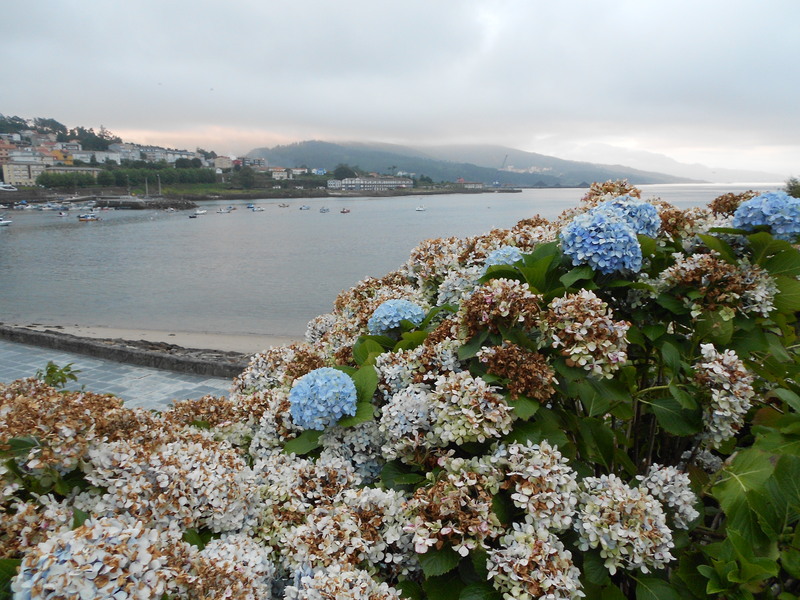 I was walking to Finisterre, he was returning from Finisterre. We greeted each other with a strong hug, and later, stayed up late into the night- each of us, I think, clinging to our last Camino moments. And that night Sonal and I made a new friend, Emma. 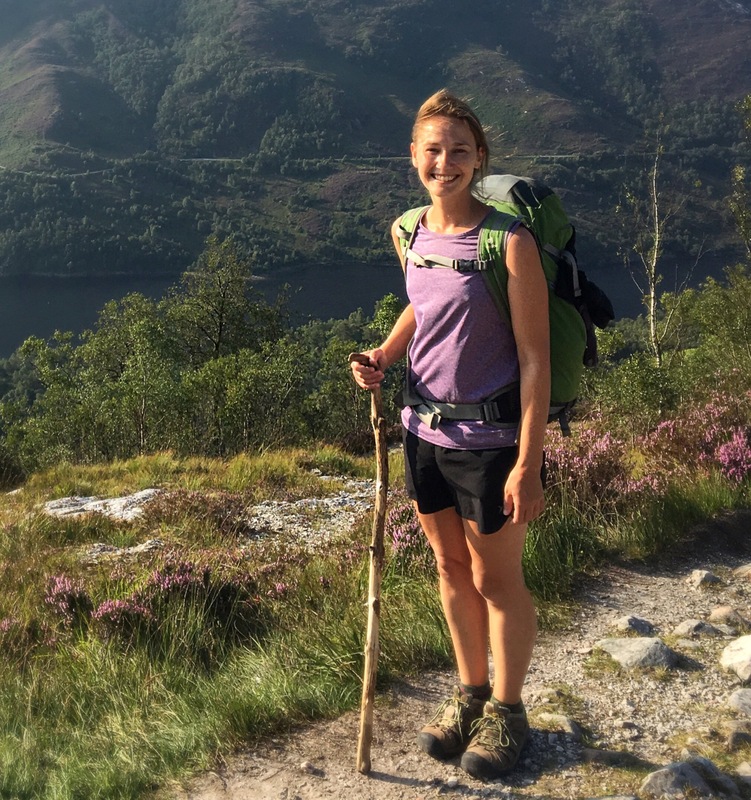 She had walked the Camino Frances six years ago, ending in Santiago, and vowed that she would return one day to complete the walk to Finisterre. She kept her promise and had started out from Santiago the same day as Sonal and I did. We talked with her that night, sitting around a long table outside of the albergue’s bar, as the stars came out and the air grew cool. People kept joining our table, sliding up chairs, laughing at jokes, pouring shots of hierbas from a tall bottle. We toasted, all of us. I looked around the table and marveled at the combination of people sitting with me: a pilgrim who had left St Jean on the same day that I did, but who I hadn’t talked to until the very end of my journey. New pilgrims I had just met that day. A pilgrim who had walked six years ago and had just returned to complete the journey. And my friend from home, a brand new pilgrim two days into her walk, but someone I’d known for 20 years. So many different connections: so unexpected, so magical. As I drifted off to sleep that night- top bunk, muffled snoring from the corner of the room- I realized that my Camino hadn’t ended after all. 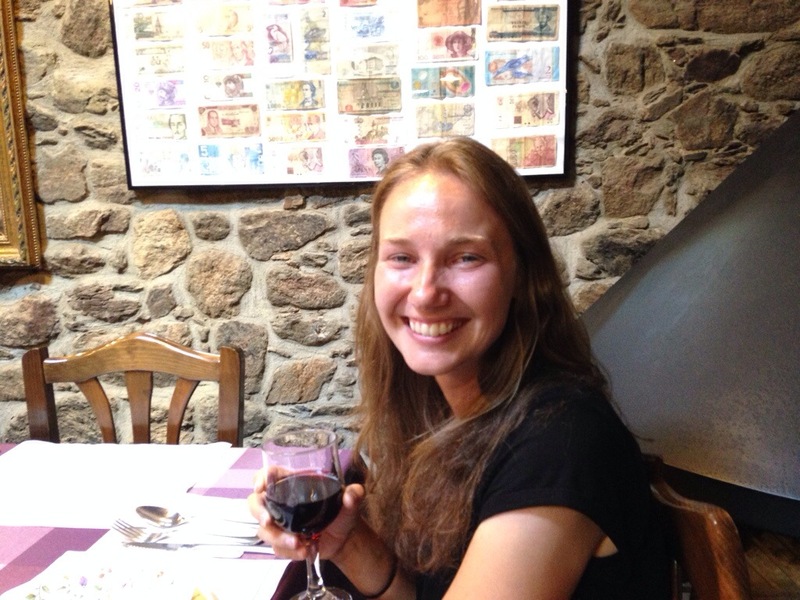 I walked into Santiago over a month ago… a month! I traveled for a few more weeks after that, but even so: how has it already been a month since the end of my pilgrimage? Since returning home I’ve thought about the Camino every day. At first it was all I could do to just settle back into life and catch up on sleep and see friends and family and adjust to being home. 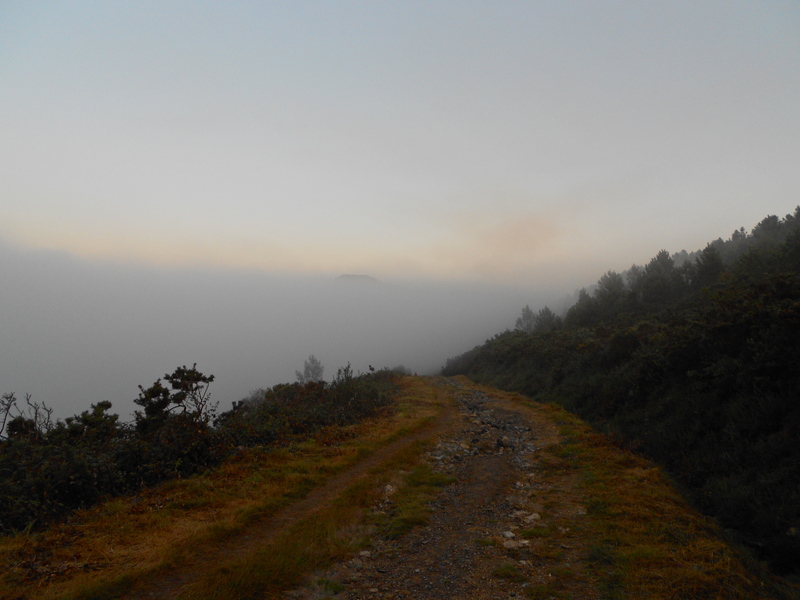 The Camino- and everything it entailed- was sort of a hazy presence that I knew I would get to, eventually. And I’ve been trying to get to it lately- go back and sort it all out in my head, wrap my mind around what it meant, what it continues to mean, what it will mean for my future. But it will probably take years to sort out and by that time I’ll have walked another Camino and will need to figure that one out… it’s going to be a lifelong process, I think. That being said, I’ve been doing some good, solid post-Camino thinking. The other night I got together with a friend who walked the Camino Frances six years ago, and I had a million questions for her. At first they were fairly standard: how heavy was your pack, what was your experience like in this town, etc. But then I started to get to what was really on my mind: how and when did you form friendships? 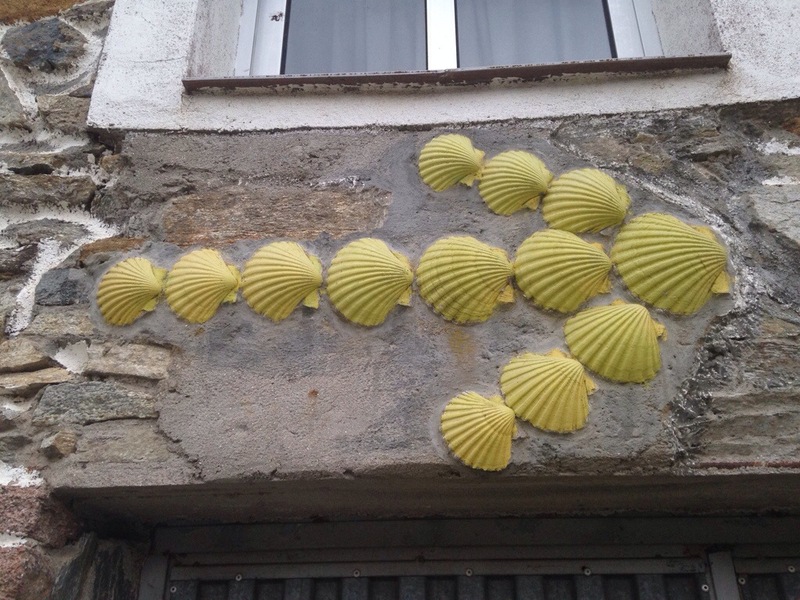 Did they last throughout the Camino or did you break away? Did you find that the Camino gave you what you needed? This is a big one, it’s the question that’s occupied most of my post-Camino thoughts. 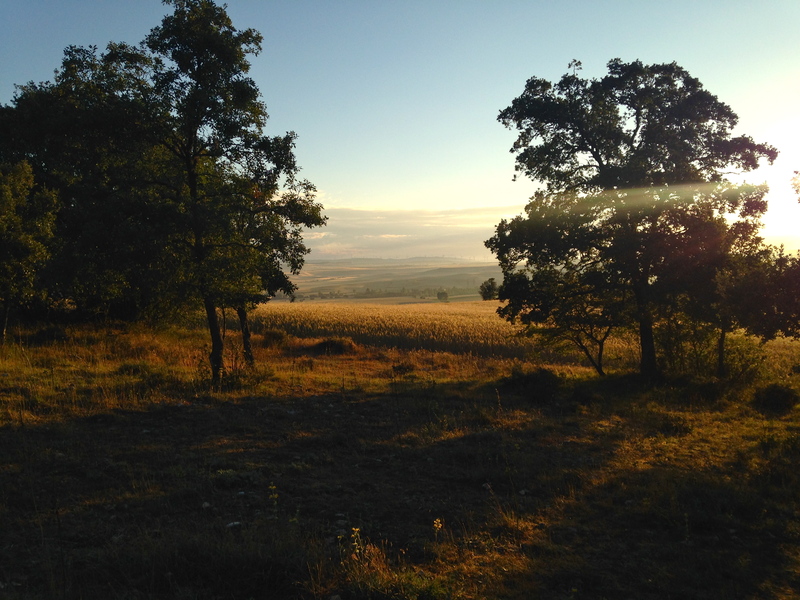 “The Camino provides” was a phrase that I often heard during my walk, and one that I’ve used myself from time to time. Nervous at the airport in JFK, wondering what I was getting myself into… and then right away I meet Julie, who is also walking the Camino, also a bit nervous, and so happy to talk to me. The Camino provides. Our flight is delayed, we are stuck in Iceland overnight, by the time I make it to St Jean I am a day behind schedule. Had I started on June 26th, as planned, it would have been a wet, gray, rain-soaked walk through the Pyrenees. But June 27th, the day I started? Clear blue skies, views for miles, sunshine and a cool breeze. The Camino provides. I worried about meeting people and making friends, and while I was so glad to walk that first day alone, I couldn’t help but notice other pilgrims linking up and walking together. On the last hour of the descent to Roncesvalles I met Mirra, from San Francisco. 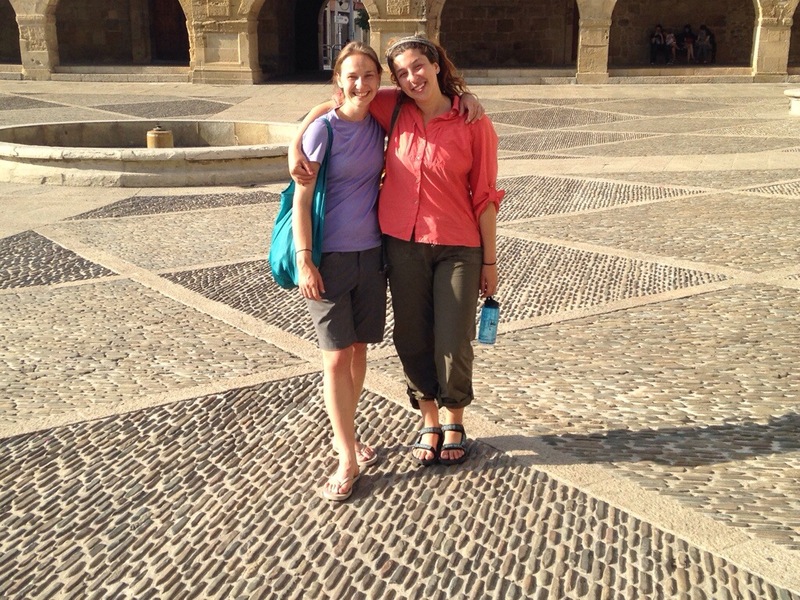 We ended up sticking together until she left in Burgos, and I couldn’t have imagined a better person to spend the first half of my Camino with. The Camino provides. And this was just the first few days of my trip. 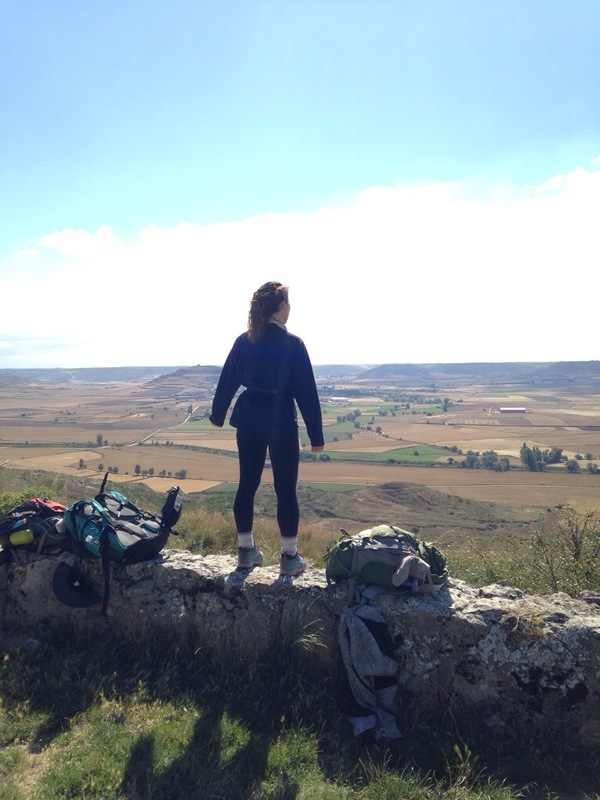 There are countless other examples of how the Camino provided something to me when I needed it. Small stuff: an open bar when I was desperate for coffee. A snore free night when I most needed sleep. But the bigger stuff, too: companionship when I felt the most alone. Guidance when I felt lost and uncertain. And then, well, there was my entire Camino. I’ve wondered- while I was walking and now, a month after I’ve finished- why everyone had the Camino experience that they did. Why was my Camino so, so good? Why was I so lucky, so blessed? Why did I avoid injury and pain? How did I escape the bed bugs and the notorious snorers? How did I always get a bed, and sometimes the last bed? How did I avoid walking in the rain? How did I meet the most incredible people, always at just the right times? How did I have so much fun? Something we started saying towards the end of the walk was- “Oh, Camino.” and “Why Camino, why? ?” It’s like we realized- for good or bad- that this experience was a bit out of our control. 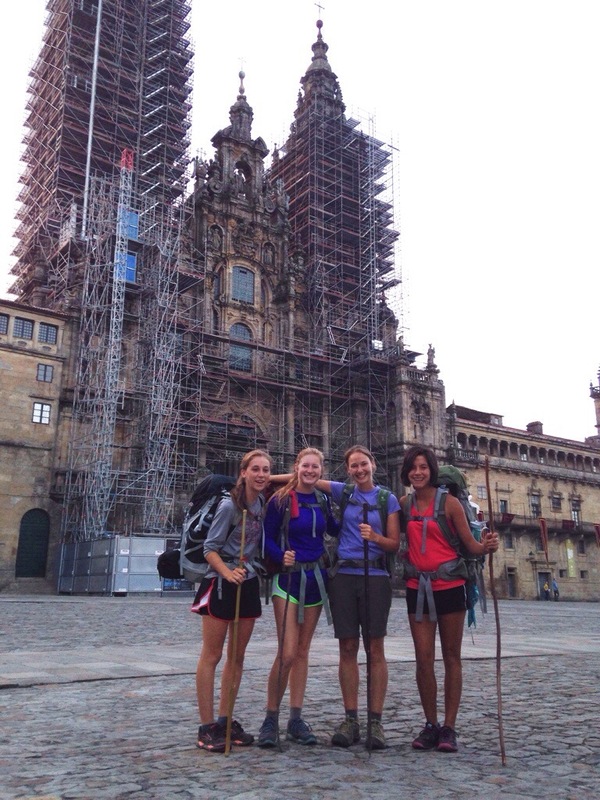 The Camino was going to give us the experience we were supposed to have, and we could question it but in the end, the only thing we could really do was accept it. 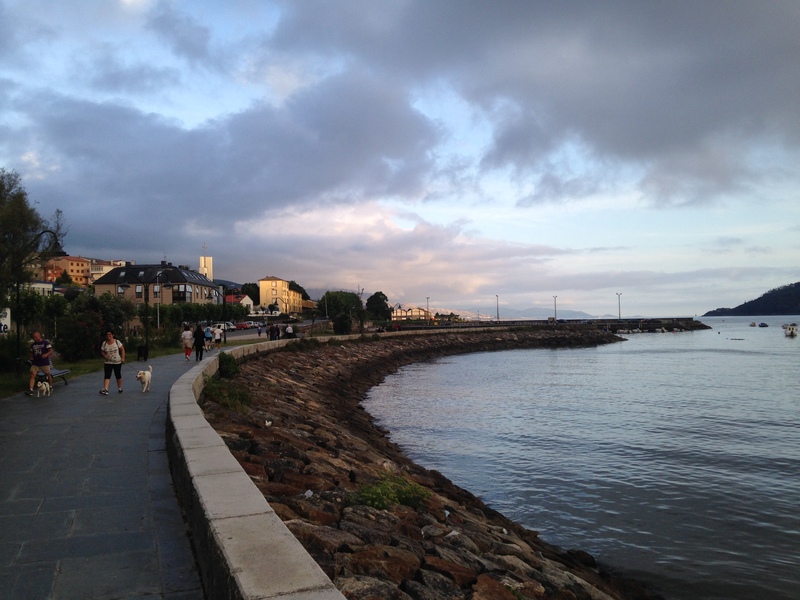 Why, for instance, did Susie, after an injury riddled walk, get bed bugs on her last night in Finisterre? Why did Joe and Adele, ready to relax and celebrate, get food poisoning the night they arrived in Santiago? Why did Laura, the Italian mother, get a huge blister on her heel three days before the end of the walk? I think about these examples, of the pain and struggle at the very end of the pilgrimage, and I wonder why. Why does anyone have to experience pain? Why them, and not me? Was it for Susie to prove, once and for all, that she was far stronger than she ever could have imagined? That Joe and Adele, on their honeymoon, were able to support each other- truly- through the good and bad? That Laura could put a smile on her face and continue to walk and be the best possible example for her 12- year old daughter? I don’t know. It’s what I saw, and I suppose that the meaning of any life experience- Camino or not- is what we make of it. 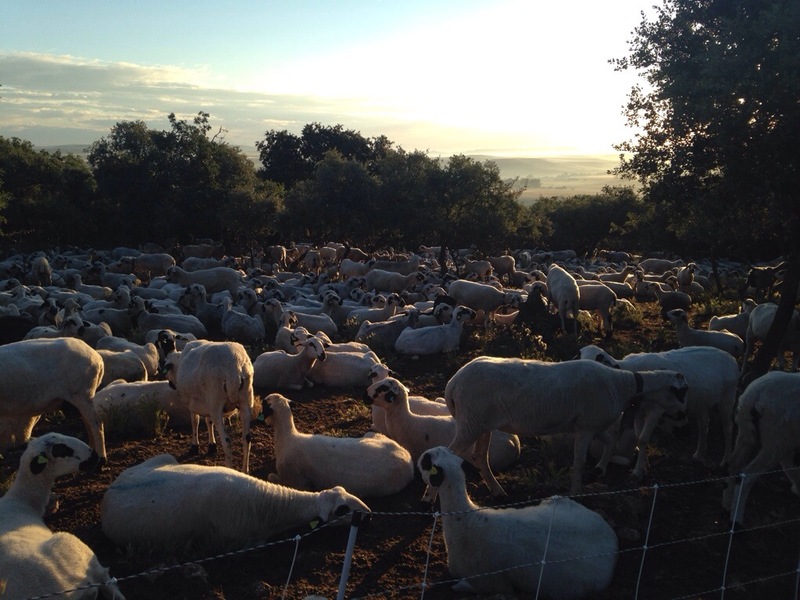 And this is what I saw, in part, on my Camino: the Camino gave me joy and life and fun. 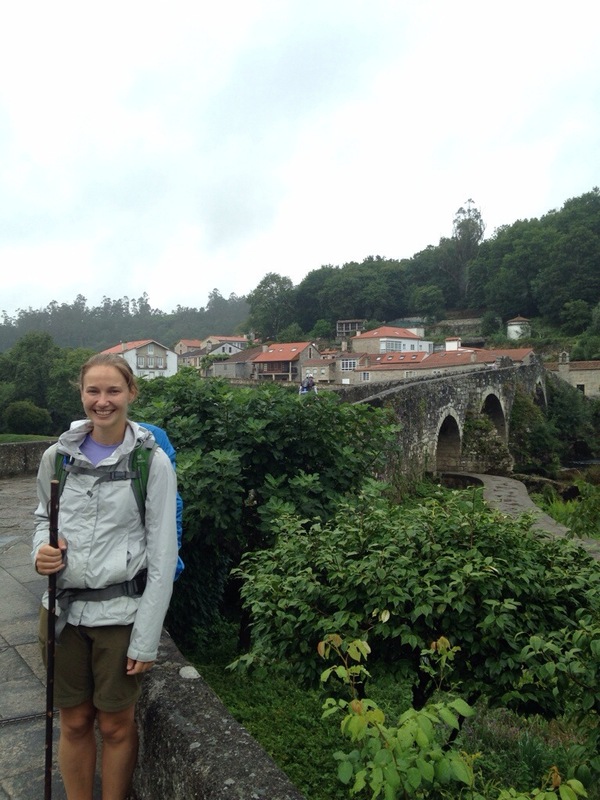 I came to walk the Camino for many reasons, but the timing of it was because I needed to move towards something. The serious relationship I’d been in had ended 6 months before and the better part of the last year had been very difficult for me. I wasn’t happy, I wasn’t having fun, I was just getting through my days in order to get to a better time. Even though I knew I would find it again, I couldn’t feel the joy in life. Why does anyone experience pain? I don’t know, but I do know that the contrast of such incredible highs after difficult lows is a thing of beauty. It’s life: we feel pain, but we can also feel joy. We can also feel great joy. I came to the Camino, in part, to feel life again, all of the beauty and magic and hope and joy of life, and I was flooded by it all. My Camino wasn’t perfect, or totally pain free. Sometimes it felt difficult. But most of the time, it seemed like all I could see and feel was beauty and magic and joy. Right now I’m in Vigo, a coastal town south of Santiago. I’m in the train station, drinking my second cafe con leche of the morning. I’d planned to take a 10:33 train back to Santiago but when I arrived at the station, I found out that the train I wanted wasn’t running, so I’m here until noon. And that gives me plenty of time to drink coffee and write. I miss being a pilgrim. 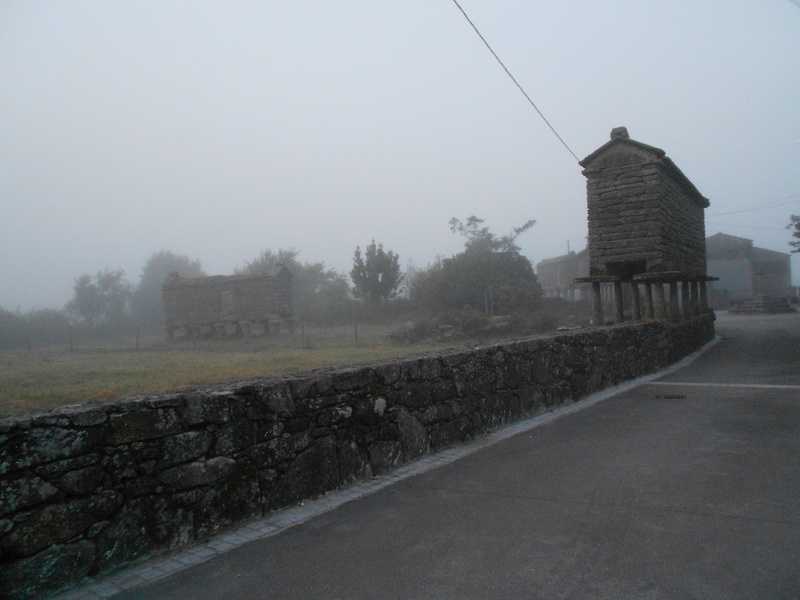 I still get to walk to Finisterre; I leave on August 2nd to walk for 4 days with a friend from home, so I know that I’ll still get to experience more of the pilgrim life. But mostly, my pilgrimage is over, and walking with a friend is going to be a different experience. I think it’s going to be so much fun, but it’s no longer my pilgrimage. I have such mixed feelings about the ending of this. In many ways I was ready to reach Santiago, because it was always the destination, and I always knew that I would be walking for about a month. As I got closer, I was excited about reaching my goal. But the end has also been heartbreaking. Saying goodbye to the friends I made along the way, accepting that there were a few people I probably wouldn’t get the chance to say goodbye to, not knowing whether I would ever see some of these people again… there’s an aching, beautiful sadness to it. I expected to really celebrate the night after I arrived in Santiago. I’d hoped to see so many of the people I’d gotten to know over the last month; I expected to go out and have drinks and eat a good meal and crowd around a table and laugh and sing. But that first night was different. I kept looking for ‘my people’, but I couldn’t find them. The Koreans all took off for Finisterre. Susie and Helen were already there. Saskia was on her way to the coast, maybe even walking another 70 kilometer day. Ibai was gone too; I’d hoped that he would be in Santiago when I arrived, and when I heard that he had already left my face fell. I started this walk alone, and the first friend I made was Mirra. But the second friend was Ibai: we walked the last hour of our second day together, we walked into Pamplona together, we cooked a meal in Puenta La Reina together. As Mirra and I walked around Santa Domingo we heard a distant voice calling our names: it was Ibai, at the top of a tower high above us, waving and smiling. I watched as Ibai led others through a yoga practice in the courtyard of an albergue, I watched as he approached someone walking alone and began talking to them in his gentle and friendly manner. When his shoes were stolen I stayed with him for the entire day. Throughout the walk I was often separated from him, but every two or three days we would end up in the same town, and every time we heard each others’ voice we would run over and hug. We both walked the Dragonte route, and late in the day Ibai told me that he was glad we could spend time walking together, before the Camino ended. I last saw him in O’Cebreiro, as we walked out of town together. We stopped at a small bar and I left him sitting at the counter, drinking coffee. “If we lose track of each other, I’ll see you in Santiago, on the 27th, okay?” He nodded. 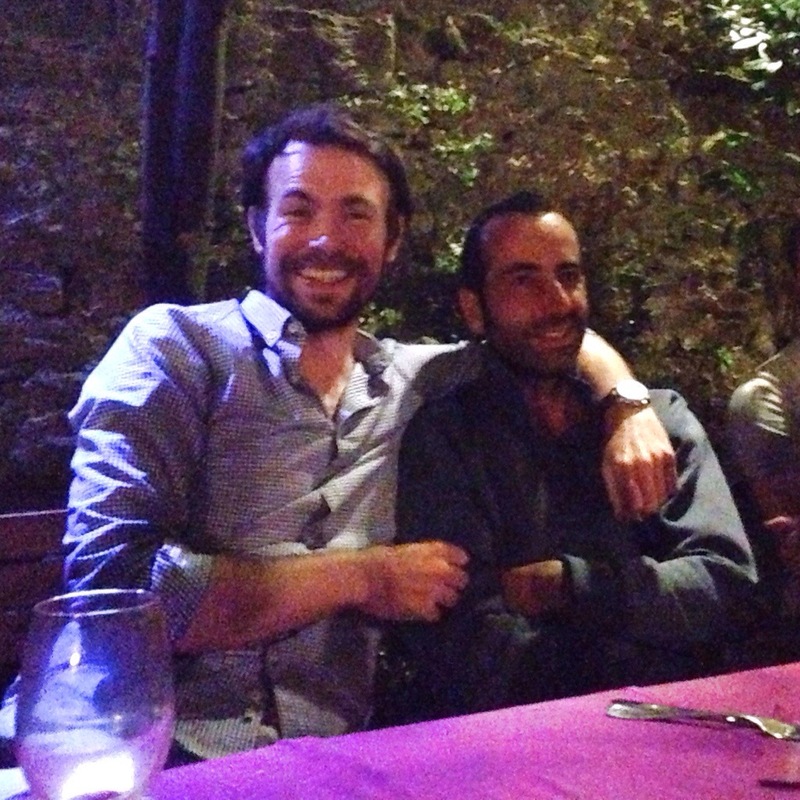 My night of celebration on the 27th, in Santiago, didn’t feel right without Ibai. It didn’t feel right without the Korean cousins, Hyoeun and Jiwoo. It didn’t feel right without Susie and Helen, without June and Jonathan (who I hadn’t seen in weeks). It didn’t feel right without Steve and Peg and Blas (who all ended in Leon). And it didn’t feel right without Mirra. I loved the people I was with: Adam. Joe and Adele and Matteo. I was happy to be in Santiago. But it wasn’t the celebration I’d been hoping for. And I realized that I had, in part, chosen this. I could have picked up a Camino family along the way to walk with, to stay at the same albergues with, to arrive in Santiago with. I could have collected phone numbers and emails and tried to stay in touch along the way, coordinating get-togethers. But I chose to do this mostly alone, and to stay independent and separate. I struggled with this choice a lot, but all along it felt right. I wanted to arrive in Santiago by myself. 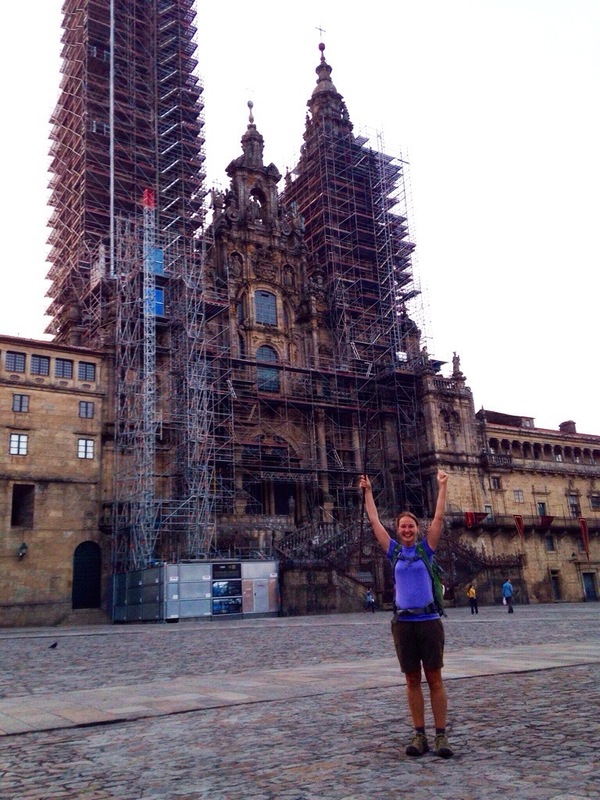 I would have loved to be surrounded by all of my friends, posed in front of the cathedral with our arms in the air, but that image was never the Camino I chose to walk. I made friends along the way- so, so many- and I needed to accept, finally, that it was okay to lose them. 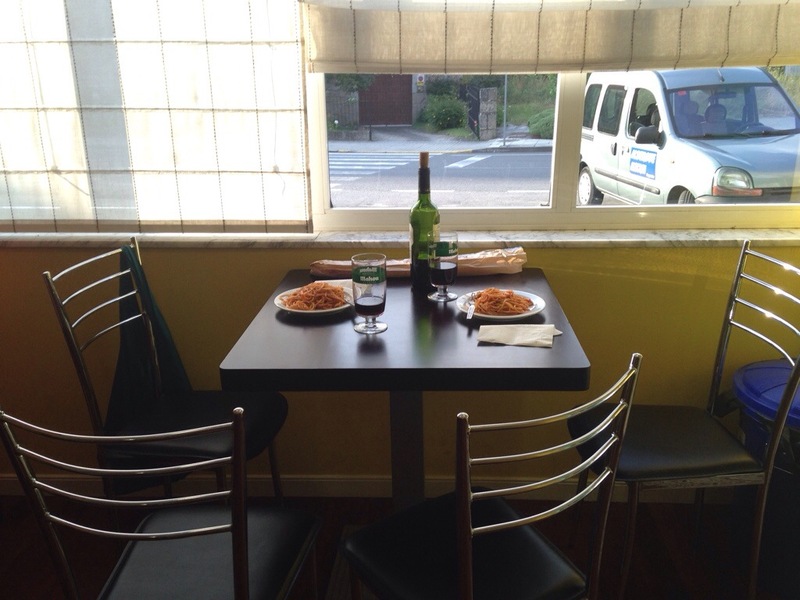 I spent the 28th in Santiago, drinking coffee and eating good food and roaming around the city. I’d been planning to take off for a few days to explore the coast of Galicia, and had been thinking about leaving sometime late in afternoon on the 28th. Something held me back, and I decided to leave Santiago on the 29th instead. And thank goodness for that decision. Word was going around that pilgrims were meeting at 7:30pm at the horse statue near the cathedral. I walked over with Adam, curious if I would know anyone, and my heart sank a bit when I saw the group of people gathered. All strangers. I began talking to some of them, and like it usually is, the conversation was so easy. It was fine to meet new people, but now, at the end, I wanted familiar faces. When the Korean cousins left there were strong hugs and a few tears. Jiwoo walked backwards down the street, waving to us until he was out of view. Our group moved on, stopping by a restaurant to find Rudy, who I’d bonded with in St Nicolas. We walked in and Rudy gave me a gigantic hug. I rounded the corner and there was Sung Eun, the Korean opera singer who I’d met in Santa Domingo, and walked with through Castrojeriz. When she saw me she gasped, stood up, and started crying. To her right was Carlo, the Italian man who speaks little English, but who I’d seen in the same albergues every day for nearly two weeks in the middle of my Camino. I’d lost track of him about a week ago, and his face glowed when he saw me. As we left the restaurant and walked down the street, we saw the tall Korean boy who I ran down a hill with over two weeks ago. The four of them joined us for dinner, and there we were, 16 gathered around a table in a beautiful outdoor courtyard, drinking wine and eating pulpo and grilled vegetables and croquettes and bread. My Camino family. I wasn’t alone after all, I suppose I never have been. We’d been urging Sung Eun to sing a song for us, and finally she obliged, standing up shyly and telling us that she would sing two songs. ‘The first is a traditional Korean song,” she explained. “And the second is a farewell song”. Her voice rang out through the courtyard, and as she sang the other tables grew silent, everyone listening to her clear and strong voice. We applauded and toasted when she finished, but there were tears too. It was beautiful: her voice, the courtyard, the night, the friends, the journey, the Camino. I walked into Santiago on Sunday morning at 7:30. The sun was rising behind me and the streets were just about empty. Somewhere ahead of me and somewhere behind me were other pilgrims, but I couldn’t see them. I was alone, and it was exactly how I wanted it to be. I moved further into the city and I saw 5 pilgrims climbing some stairs and walking into the street in front of me. My first thought was, ‘I either need to drop ahead or behind them to give myself some space’. But them I looked at them a little harder, something seemed familiar. A man and a woman walked ahead, and three girls walked behind. It hit me at once: they were the three American girls who’d come to walk the Camino on a school trip; the same three who were eager to talk to me in Estella, who were a bit homesick and missing their friends, who walked with their right arms stretched outwards to the sun (to get an even tan, of course), who I shared my dried fruit with one day on a long, hot walk when they were struggling. I hadn’t seen them for at least two weeks, and assumed that I would never see them again. But suddenly, 10 minutes from the cathedral in Santiago, here they were. I rushed to catch up. “Hey guys!” I called out. The girls turned around and they beamed when they saw me. “Hi!! !” they all cried. 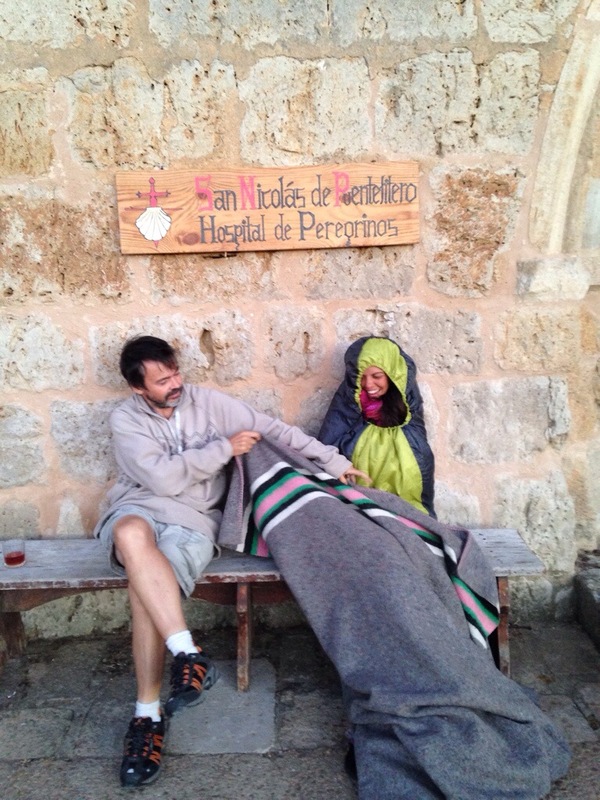 We all started chattering, they had been in Santiago for two days and were just leaving to walk to Finisterre. “You’re so close to the cathedral!” they told me. So I ended the walk alone, just like I had begun. The square was quiet when I entered, the cathedral covered in scafolding. I stood quietly for a few minutes and thought about how far I’d walked, and when the American group caught up with me we posed for photos and the girls asked if they could friend me on facebook. The rest of the morning- the rest of the day, so far- has been great. I got a cafe con leche, I walked back to the cathedral and ran into people I knew and took photos and laughed and cheered. One of the Korean girls I’ve gotten to know handed me a small note that she’d written, and I was so touched I almost cried. I received my compostela, I checked my pack for a few hours, I hugged the statue of St James and then went below the altar to kneel for a few minutes before his remains, and said a prayer for the nuns, for my family, for my friends, for everyone I met on the Camino. I met up with friends and drank another cafe con leche and every time I recognized someone as they passed my table, I jumped up to give them a hug. I attended the pilgrim’s mass and saw the botafumeiro swing. I ate pulpo for lunch and drank sangria, I took a shower in a real, private bathroom, I wandered into the city and found a quiet corner and ordered a tinto de verano and sat down to write. Carol and Laura, (the Italian mother and daughter and two of my favorite pilgrims), just passed by and sat with me for awhile. Around a wooden table under a large white umbrella, with a soft wind blowing, old Spanish women walking by arm in arm and dressed in Sunday clothes, muted sounds from the television inside the bar, and ice clinking in our glasses: this moment feels so good. It is the end- a little bittersweet- but mostly it just feels good. I finished my walk and my Camino, but I’m excited to see what happens next. 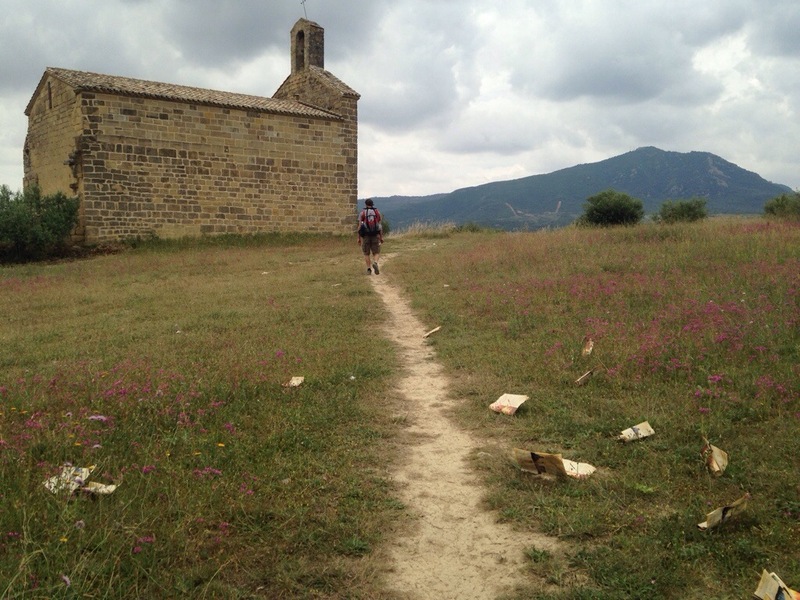 Because like so many have said, the Camino continues, or begins, after the walk has ended. From here, it feels like my journey could take me anywhere. 5km to go. I stopped in a place called Monte Gozo and it’s a little bizarre. It’s like a huge, deserted complex for pilgrims. There are other pilgrims here, but it’s such a large and isolated campus that it feels empty and desolate. I’d heard from a few people who were here in the last few days that it’s a bit like a ghost town, and I think that description is accurate. Empty playgrounds. A boarded up supermercado. I wasn’t sure how to approach these last few days of the Camino. When I stayed in Portomarin three nights ago, I decided that if possible, I wanted to try and stay in small albergues for the rest of the way. The crowds add such a different feeling to the Camino, and I wanted to avoid them as much as possible. 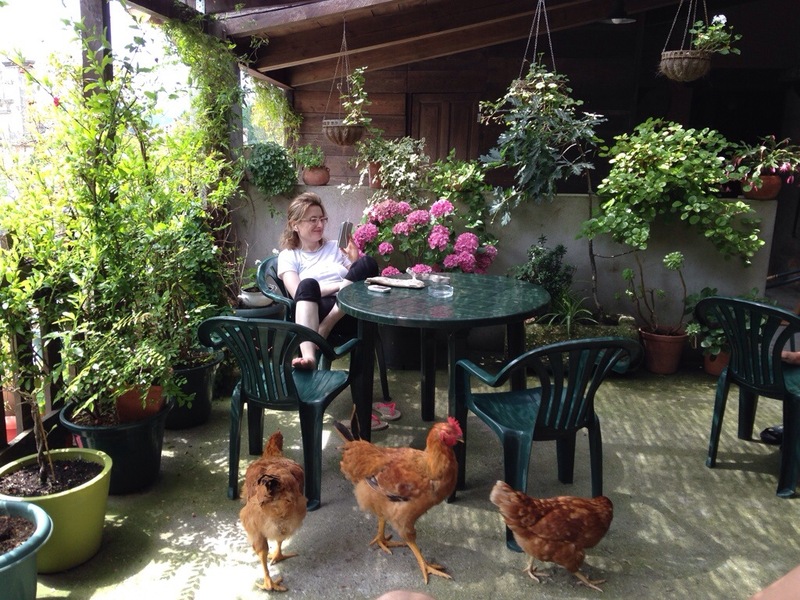 That plan worked well two days ago, when I found a small, private albergue in a quaint village, where chickens and cows roamed the streets, and where I could sit for hours outside, drinking tinto de verano, eating potato chips, writing in my journal, and talking with other pilgrims. Yesterday I met up with Adam in Arzua, where most other pilgrims stopped for the day. We decided to keep walking a few kilometers further, to try our luck with a smaller albergue. We walked a few kilometers, and then we walked a few more. And then a few more. There weren’t many accommodations and what we could find had no beds left. 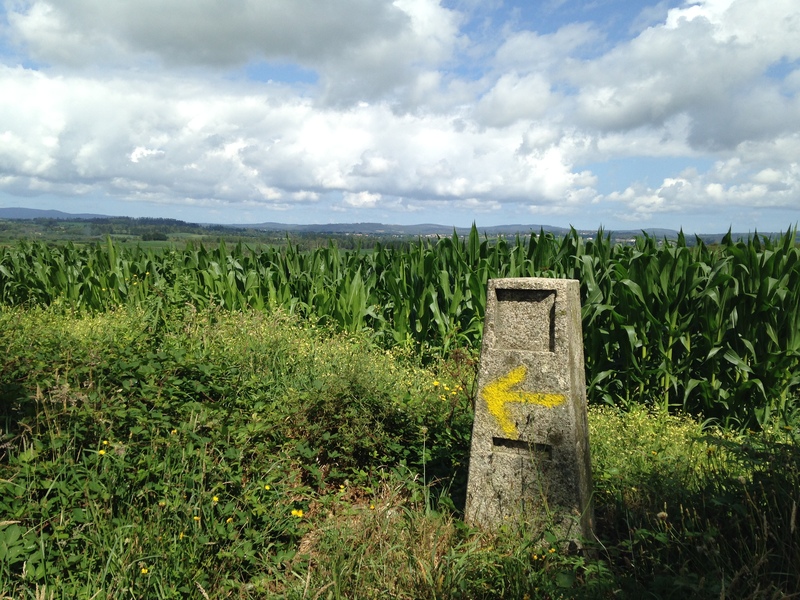 At some point on the Camino, a bit before the 100 kilometer point, markers started appearing every half kilometer, counting down the distance to Santiago. And as Adam and I walked, I watched those markers tick past: 40 kilometers to go. 35. 30!! 25. 24. We stopped in a town 24 kilometers outside of Santiago and I knew that I could easily do that distance in one day, but I wanted to stretch it into two. My plan- for as much as I can actually plan anything here- is to leave early tomorrow morning for a sunrise walk into Santiago, to get in with plenty of time to take photos and drink a cafe con leche and store my pack and go to mass at noon. I feel very uncertain about the end of this experience. I’ve wanted to have ‘perfect’ Camino days as this experience is ending, but I can only control so much. The Camino is different with so many people walking; the scenery isn’t as beautiful and breathtaking as it was a few days ago; somehow, my body has decided that it’s about had it (wasn’t I just saying how strong I feel? I AM strong, but I’m also tired. I think because my mind knows that I’m almost done, it’s told my body to wind down). But instead, all I could focus on were the steps. One foot in front of the other. The pain in my right calf (day 30 and my leg started hurting, go figure). The small pebble in my shoe. The humid air and a hyper-awareness of my body odor. Did I put on deodorant this morning? Was the coffee I drank decaf? Why don’t I have more energy? Where in the world did I put the second pair of headphones, did I actually lose another pair? Can I reach my arm around my pack and find my banana without having to stop and take the pack off? 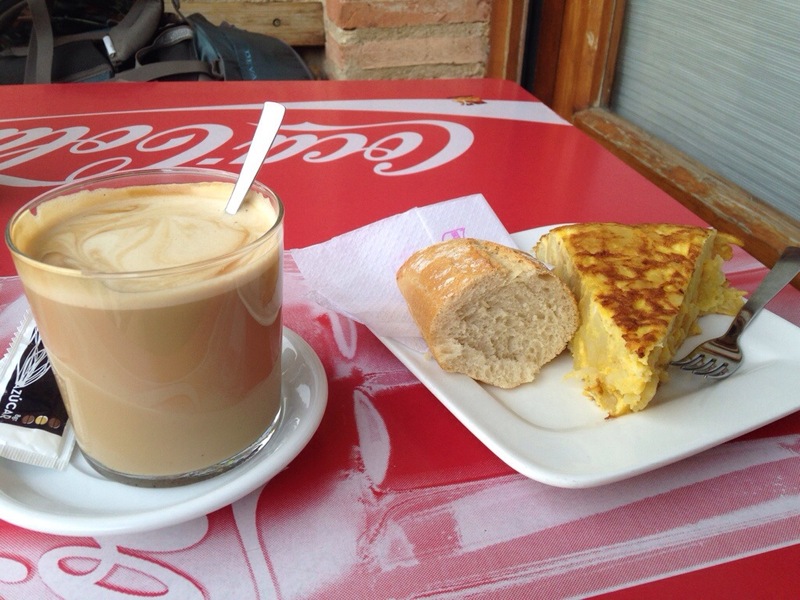 Where can I stop for another cafe con leche? Can I pass those pilgrims ahead of me? I can definitely pass those pilgrims ahead of me. The time for deep thoughts was not this morning. And I’m not sure it will be tomorrow morning either: I’ll only walk for about an hour, and I think the road will be crowded. But it’s okay, I’ve had plenty of time to think on this walk, and I’ll have plenty of time to think about it after I’ve finished. And besides, it’s hard to fully process something while you’re still in it. I think I’ve written about this a little already, but I heard it described so well a week or so ago that I want to write about it again: this idea of the Camino being divided into thirds. David, a man from Ireland, said two things. The first was that the Camino really begins after the walk ends, and it’s something that I’ve heard several times before. Then he talked about the three parts of this journey: the first 10 days or so are about the body, the second 10 days are about the heart, and the last 10 days are about the soul. And I liked that, especially the third part. I’ve had so many deep and soulful encounters in the last part of this walk and I think it’s been an aspect of this trip that I’d been anticipating and waiting for. I’m not sure if I’ve sought out these connections and moments or if they’ve appeared because others are in this frame of mind as well. But they’ve been here, and they appear so quickly and effortlessly. First it was Masa-Hiro, a man of Japanese descent who was raised in Peru and has lived in Malaga for 13 years. I walked with him out of O’Cebreiro and we played the ‘animal game’, which sparked a conversation about what we are looking for, how others perceive us, who we really are. I ran into him again a few days later, sitting on a bench outside of an old stone home of an Italian woman who’d been living in Spain and offering coffee and fruit to pilgrims as they walked past her house. There was a wooden table filled with juice and peaches and coffee cups, tattered Tibetan flags strung from a tree, and several small dogs lounging in the sun. As I approached and Masa-Hiro saw me, his face lit up and he rose to greet me. He introduced me to an Argentinian woman sitting next to him, and a few minutes later Eva walked up, a woman I had met in St Nicolas nearly two weeks before and hadn’t seen since. The 20 minutes I spent at that little outdoor oasis felt a bit mystical, and when I stood to leave, Masa-Hiro gave me a strong hug, and the other women embraced me as well. And I do have a lot of happiness. I’ve been so happy on this trip, and so often I’ve felt like I’ve been too lucky to feel this happy. It’s the mark of a good Camino, I suppose. 5km to go. Time to end this long walk. It’s only been in the last few days that I’ve felt close to Santiago, and aware of what that means to me. I’ve been walking towards Santiago for 28 days, but I couldn’t really put it all together in my head until yesterday. Until now, it’s all just been walking: day after day. I knew that the kilometers were adding up, but I wasn’t paying close attention to how much I walked or where I was on a map. I was just walking, and taking in the experience. The first thing that struck me was something three nuns said, on a little hill on the outskirts of Ponferrada a few days ago. Saskia and I had been walking by when we saw them picking fruit from a tree. Saskia, who can speak Spanish, asked what the fruit was. The answer was plums, and instantly the women reached down to us, offering handfuls of the round fruit. They filled our hands, offering more and more. The plums were spilling out of my grasp and rolling down the hill, but they kept reaching down to give us more. Two guys were approaching (who, it turns out, had just started their Camino that day and were about 20 minutes into their walk). I shoved handfuls of plums at them, and the nuns continued to give us more, speaking in Spanish the whole time. We finally left, our hands and pockets overflowing, and I asked Saskia what they were saying. It gives me chills now as I write this, the idea that these three holy women recognized the importance of what we were doing, and saw a great meaning in our walking and in our destination. I’ve tried to be aware that I’m on a holy pilgrimage, but it wasn’t the reason that I chose to walk the Camino, and it’s been overshadowed by so much here. I try to stop in churches when I can, and have attended a few masses and received several Pilgrim Blessings. But most of the people I talk with aren’t here for the religious part of the pilgrimage. 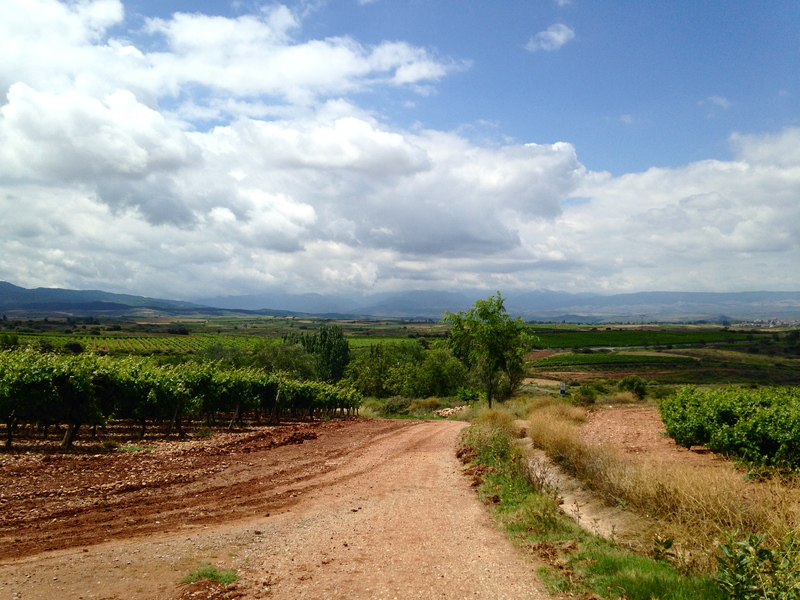 And it’s easy to forget about the history of the path we’re walking on, and the reason that this Camino exists at all. But when I heard that the nuns asked us to pray for them in Santiago, something shifted a bit in my head. I knew that I would say a prayer for them when I reached Santiago, and all at once, the larger scope of what I was doing came into focus. I’m almost in Santiago. And I’ve walked a long way. This is day 28, which means I’ve been walking for 4 weeks. The beginning of this Camino- that first day through the Pyrenees- feels like a lifetime ago, and it feels like yesterday. I don’t want this to end, but I’m also so excited to reach Santiago. And I’m a little surprised by my excitement. For weeks now, Adam has been talking about the sense of accomplishment we’ll have once we reach Santiago- to be able to say that we walked this distance. And every time I heard him or someone else say something like that, I couldn’t really agree. I’ve loved the walking so much, and some days have been hard, but it’s also been one of the easiest and natural things I’ve ever done, in a way. But now that Santiago is close, man, I’m excited. And I feel proud. Lots of new pilgrims have started in the last few days (including large, large groups of students, and everyone tries to figure out where they’re stopping so we can avoid those towns), and the Camino is crowded. I was expecting this, and am trying my hardest to have an open mind when I can’t walk alone. When these newer pilgrims ask where I started, I feel really proud when I answer, ‘St Jean’, and I wasn’t expecting that. But I do feel proud: I’ve been walking for a long time, and now, finally, I’m starting to feel the accumulation of all of my steps. My legs are strong. They’re really strong. I’ve always been a fast walker, but here? It’s a rare thing when people pass me. Several people have joked that I’m impossible to catch. On hilly and rocky sections of the Camino, I can nearly keep the same pace as bikers. I was walking quickly in the beginning and I’ve continued to, but now I just feel so solid. This isn’t to say that I haven’t had my hard days here, physically, but even my hardest day hasn’t been that bad. I’m proud of myself for being able to physically handle this walk, and proud that I can safely say that I could do this for another month. I’m proud that I’ve handled the potentially uncomfortable parts of this as well as I have. I worried that I would have trouble with feeling displaced, and constantly on the move, and that I would tire of the same routine day after day. But if anything, every day feels so new and exciting and full of possibility. I have no idea what I’ll see or who I’ll meet. I have a fairly good idea of what I’ll eat but since I’ve mostly been loving what I’m eating, that’s not so bad (bread, coffee, cheese, wine, fries, tuna. Mmm). 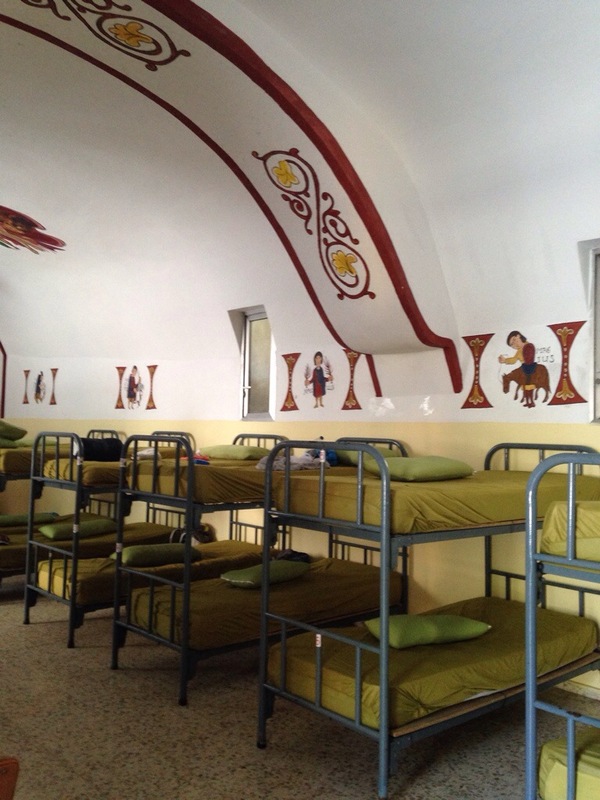 Last night I feel asleep in an albergue with about 100 beds in a wide open space. The lights were still on at 10:30 and people were moving around and talking and, somehow, I fell asleep. I’ve adapted to the strange conditions of this trip: the offbeat places where I’ve had to stay, nearly always sleeping on the top bunk, cramped and sometimes dirty showers. After the first week I gave in and bought shampoo and having been using it every since, but as for the rest of it? I think I’ve shaved my legs once, I’m definitely not wearing makeup, I wear the same two outfits every day. And I feel great. I’ve had great practice in letting go of planning, I’ve spoken up for what I need when I need it, I feel more comfortable socially than I have in a long time. I’ve loved the people that I’ve met, and it feels good to know that I’m loved in return. I’m not done with this walk yet but I’m certainly processing the ending. I had such a good walk yesterday: I walked alone for nearly the entire day, not seeing many pilgrims. The sun was shining and I was walking through a beautiful part of Galicia. I felt so good and at peace. I listened to music and at some points was dancing down the trail. Last night I stayed in Portomarin where lots and lots of people stopped for the day. I ran into so many that I knew: all of the Koreans, the Spanish man and his two kids, the Italian mother and daughter, the Vermont family. Almost everyone is going to arrive in Santiago on the same day, the 27th, and that makes me so happy. There was a long time when I thought I would fully break away and stretch out my trip and walk short days or take days off. But about 10 days ago I realized that I wanted to celebrate in Santiago with all of the people I’ve met along the way. Two days ago Ibai showed me a photo on his phone. ‘Can you see who this is?’ he asked. There was a man standing in front of the cathedral in Santiago, his walking poles raised in the air in triumph. I squinted at the photo. ‘That’s not Adrien, is it?’ Ibai nodded in excitement. ‘It is, he made it to Santiago!’ All I could do was grin. Adrien had started from St Jean on the same day that we did, but after two weeks started walking really long days to reach Santiago by his deadline. I hadn’t seen him since Hontanas. And now there he was, the first person I’d walked with who made it to Santiago. I couldn’t stop smiling when I saw the photo, and I can’t stop smiling now. I have no idea where or how to start this blog entry. The Camino continues to be amazing and surprising, but I can’t even remember where I was this morning or even the name of the town I’m in right now. Every day packs in more- scenery and thoughts and experiences and people and conversation and wine- and it’s hard to sort it all out in my head. I’d thought that the time after Mirra left, after Burgos, would be different, and it has been. I’ve adjusted, I think, to not having my best Camino buddy with me, but I’m still not sure how I feel about these past 5 days. I’ve continued to have fun, I’ve continued to meet people, and I’ve sort of picked up a new ‘buddy’- Adam, from Ireland. But it’s still so different, and my feelings about it all change from hour to hour. Right now I’m at a bar (again- in these small towns especially there’s nothing to do before dinner but take a nap or have a drink. I should probably be napping, but it’s too much fun to go to the only bar in town and sit around a table with all the Pilgrims who happened to stop in the same place). I’m alone at the table but 5 minutes ago there were at least 10 other people here. 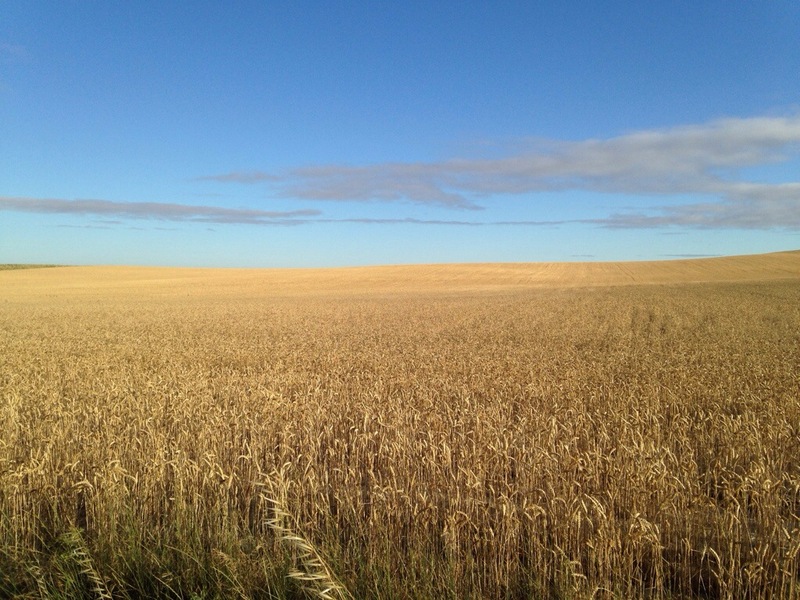 We’d heard that the village’s only store just opened, and everyone rushed to buy food for the long walk tomorrow (and since we’re in the Meseta, there are some incredibly long stretches where we pass through nothing but wheat fields for nearly 20 kilometers). Adam offered to pick up some food for me which is perfect: someone to help me out, and a stolen few minutes of peace and quiet. Me at an outdoor table typing away, the local villagers chatting and drinking coffee. Except for Adam and another Irishman I met two days ago, I didn’t know anyone at this table. It is a vast difference from the first two weeks of this trip, when I would walk into a town and be greeted with waves and smiles and cheers and hugs and jokes. I’ve met so many people on this Camino, and have connected with so many in small but meaningful ways. I think of Blas as my Spanish grandfather: he’s probably closer to my father’s age, but there’s something about him that reminds me of my grandfather. He is charismatic and knows everyone. Once his day’s walk is finished he strolls around town in his button down shirt, smoking a pipe, drinking an espresso. When I arrived in Ages he came over to greet me and tell me where the good albergue was, and Vicool, who I’d been walking with, whispered to me, “He’s a pilgrim? 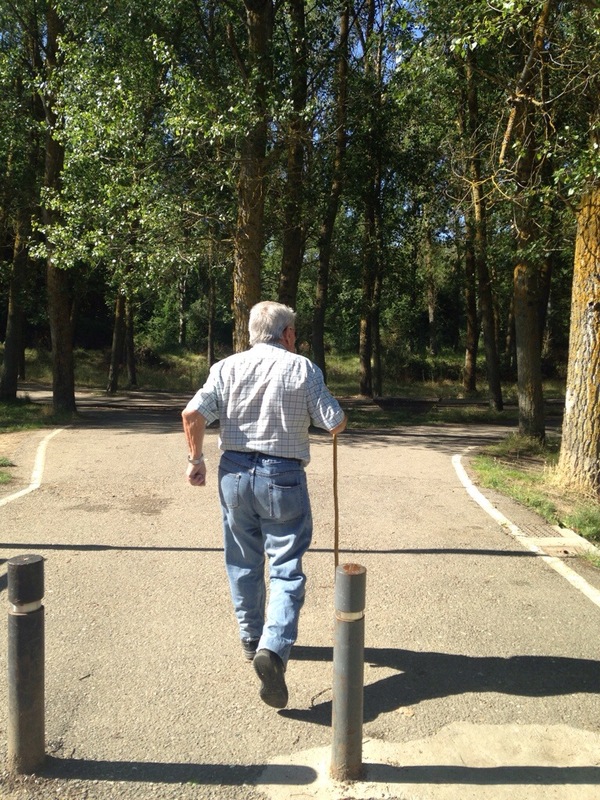 I thought he was the mayor of this town.” I met Blas about a week ago while I was walking. We were the only two around and I’d stopped to take a photo, and he offered to take one of me. We started talking-slowly, because he doesn’t know a lot of English- and after about 30 minutes I knew that I had someone looking out for me. Every time I’d arrive in a town and run into Blas, he would give me a big hug and make sure I was doing okay. Today was probably the first time I’ve arrived somewhere and have not been greeted by Blas. Jerome I only met a few days ago, at the tiny albergue, St Nicolas (which I probably need to devote an entire blog post to). 12 of us stayed there, and I hadn’t known anyone. It was the first time in two weeks that I separated myself from the people I’d been walking with, and I was a bit nervous to meet new people. Jerome walked right up to me and shook my hand, he’s a French guy from Paris, probably in his mid-twenties (but doesn’t tell anyone his age). We sat on the grass in the back of the albergue, and after 10 minutes I was giving him English lessons and he was telling me about the girl he’d walked with for 2 weeks who had to stop her Camino because of tendonitis. They’d fallen in love and promised to meet in Santiago at the end of July; Jerome told me that he’d given up on love but then he met Delphine, and now all he could do is trust that she will show up in front of the cathedral. For the past few days I’ve seen Jerome when I showed up to the town where I’d be spending the night, and he would give me a look and tap his watch, indicating that I was walking too slowly. A few days ago I saw Saskia after losing track of her for over a week; the last I’d heard she had spent the night with a Frenchman in the mountains. She insists that the actual story is not as fascinating as it seems, but I disagree. A night with a Frenchman in the mountains is nothing but intrigue. Two days ago, in Carrion, it seemed like we were all together: Blas and Jerome and Saskia. Ibai and Susie and Helen. Adam and David and the Italian mother and daughter that I see every morning for coffee, and the Italian man who chooses the same albergues as I do. I saw the Koreans all over town. But now, I’m with an entirely new group of people, and it was all I could think about as I walked today, down an ancient Roman road through the north of Spain. At some point today, I think I reached the halfway point of my walk. I only know this because others have mentioned it; I haven’t been paying close attention to how much I walk each day, or how much the kilometers and miles are accumulating. I’m a little surprised that I haven’t been keeping track, but on the other hand, the miles don’t really seem to matter. In fact, they’re sort of flying by. I still love walking. I love it so much, that I feel sort of bad when people are talking about how hard or boring or long a day was, then ask what I think. My reply, almost always, is, ‘I thought it was great.’ I got some crazy stares today, when I talked about how much I loved the long, straight road that went on for miles. I walked alone, and since it’s an alternate route that not many people take, I couldn’t see anyone in front of me or behind. It was perfect. But for as much as I’m loving this walk, the section we’re in now is harder than any of the days that have come before. There’s little shade, so the days are hot (although I have lucked out with the weather: so far, Spain in July has been unseasonably cool). I spent the past few days walking with people, and while I’ve loved the conversation and chance to really get to know some of the people I walk with, it’s also been hard. I love walking alone, and since just about all of my post-Camino walking time is spent socializing and meeting up with other Pilgrims, I really crave the solo-walking time. I got some today, and I felt like new person: once I got into the rhythm of my walk, the kilometers flew by and my head felt so much more clear. I could start to think about some of the things that I’ve experienced here. I left a pair of shorts in Hontanas, but passed a market in Fromista and picked up a pair of ‘lounge pants’, which are unlike anything I’d normally wear but they’ve ended up being perfect. I had my foot kissed by an Italian man (this was part of the St Nicolas experience), and that same man suggested that I stop walking for a few days and stay at the albergue and help out: cleaning and cooking. I’m still not sure if he was serious or not. (and, for the record, I didn’t stay). I walked on a long straight path of the Meseta with Ibai and Adam, with Creedence Clearwater playing and the road stretching on for miles. I talked about mix tapes and driving and we joked that we were on a really long, slow road trip. I waited in a cafe in Carrion with Susie, Ibai and Adam for three hours yesterday morning; Ibai’s shoes were stolen, and I refused to leave for the day’s walk until a shop opened and he could buy new shoes. There’s been a lot of theft in the past few days at this point on the Camino, and it’s so unsettling. I’m keeping my things close and being extra vigilant. The day after Mirra left I walked to the small village of Hontanas. I walk fast and I arrived early so I secured a bed, showered, and set up at an outdoor table with my journal and a glass of wine. I was feeling a bit lonely but I compensated for this; for the next hour or two I was the welcoming committee for all of the Pilgrims coming through town, and I even convinced Adrian- the tough Spanish military guy with a heart of gold- to stop and have a drink with me before moving on to the next town. People come and go all of the time here, but I think it’s really hit me in the past few days. I know it’s probably because I’m now around all new people, but I’m having a hard time accepting that so many of the people I’ve met in the last few weeks have now moved on. Or I’ve moved on past them. I think, from my experience over the last 17 days, that I will see some of these friends again. But some are probably gone forever, and I think that will have to be okay. And I guess that’s like life. People come and go, and at some point, that has to be okay. And so tomorrow, I’ll continue to walk. Still on the Meseta, still on a long flat road, still moving slowly through this country. Still losing people, still meeting people. Saying goodbye, saying hello. Before I started the Camino, I’d done a lot of reading and research about it. One of the things I’d read was that the path was sort of divided into thirds: the first 10 days were mostly about the physical part of the journey. The biggest focus would be the pains and changes of your body. The second third was about the mind: you walk long, hot days through the Meseta, a region where this is no shade, a flat path, no distractions. A lot of time to spend in your head. I’ve heard different interpretations about the final third of the way: some say it’s about putting it all together. Some say it’s about coming to life. I’ll be curious to see if my Camino falls into thirds, or into any kind of distinct sections. Already I can see how it might happen: today, for the first time, felt like I was moving into a different stage of this journey. I’ve been around mostly the same people for the past 12 days, and it’s been wonderful. I guess this has been my Camino family, and it’s a large one. But it’s changing. Mirra will leave tomorrow and I know that this will affect my Camino. In some ways I’m excited for the change, even though I wish Mirra would stay and she and I could finish in Santiago together. But being on my own could be good heading into the Meseta. Even though I spend hours walking every day, I feel like there hasn’t been enough time to really think about this experience and process what I’m going through. I don’t regret how I’ve spent this first part; in fact, I don’t know that I would really change anything. I’ve been having so, so much fun. And so far, if I had to pick a theme for the first part of this pilgrimage, I think it would be about fun and connection. I’ve definitely felt the physical part of the walk, but not nearly like others have. All the training walks I did before coming here definitely paid off, and my aches and pains (so far) have been few. So if this first section of the Camino wasn’t about physical hardship, then I would have to say it was about the people I’ve met, and the fun I’ve had with those people. And maybe I’ll keep having fun, and making good connections- lets hope! But I also wonder if this next part of my walk will be more internal, if I’ll intentionally crave time to myself. 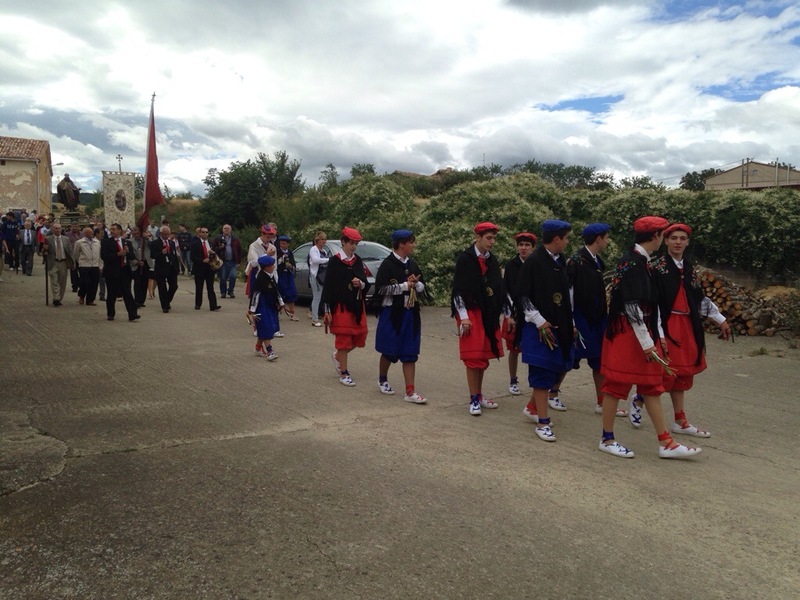 I walked to Burgos today, and the night we just had was a celebration: of beginnings, middles, and ends. 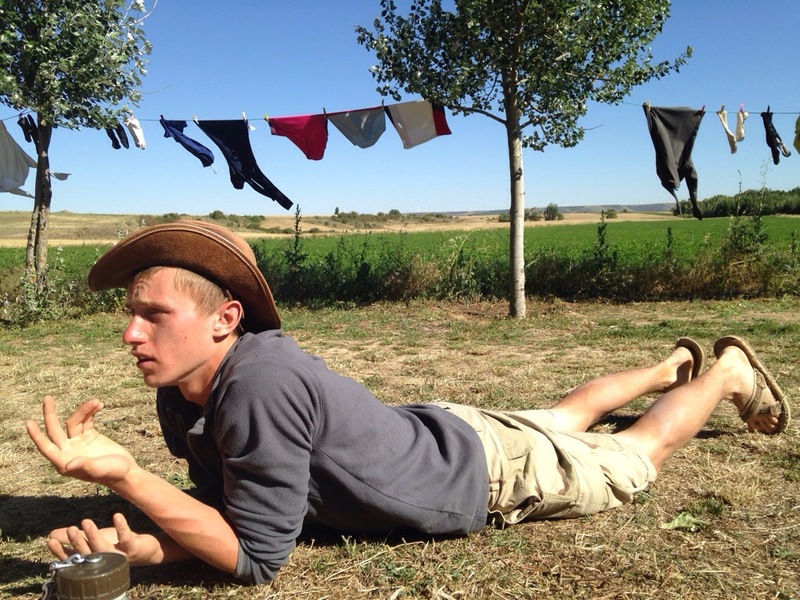 Just as Mirra leaves the Camino, Adam (from Ireland) begins. Ibai found him sitting alone in the albergue and invited him out with us. We went out for tapas and sangria, 8 of us squeezed around a wooden table filled with plates of food. We toasted, we sang happy birthday to Ibai, we told stories about our walk, we took photos and talked about keeping in touch. We walked out of the restaurant to the empty square in front of the cathedral to say goodnight and go to our separate albergues. Everyone hugged Mirra tightly, even Adam, whose walk is beginning just as hers is ending. Mirra and I walked to our albergue together, talking about what a perfect ending this was for her, and the perfect transition time for everyone else. I can feel, so strongly, that my Camino is going to change tomorrow. I’m not sure who I’m going to walk with, who I’m going to meet, who I’m going to drink wine with and cook with. I don’t know who will be sleeping in the bunk bed above or below me, because for almost every night of my Camino, Mirra has been my bunk mate. But I’m also excited for the unknown. Two days ago I discovered that I left my guidebook at the albergue I’d stayed in. I panicked for about an hour, not knowing how I would figure out my days and plan where to stay and know how far to walk. But I’m choosing to see this as a big sign from the Camino: time to just let each day unfold and let go of trying to plan. And I think this will be a good lesson for me. 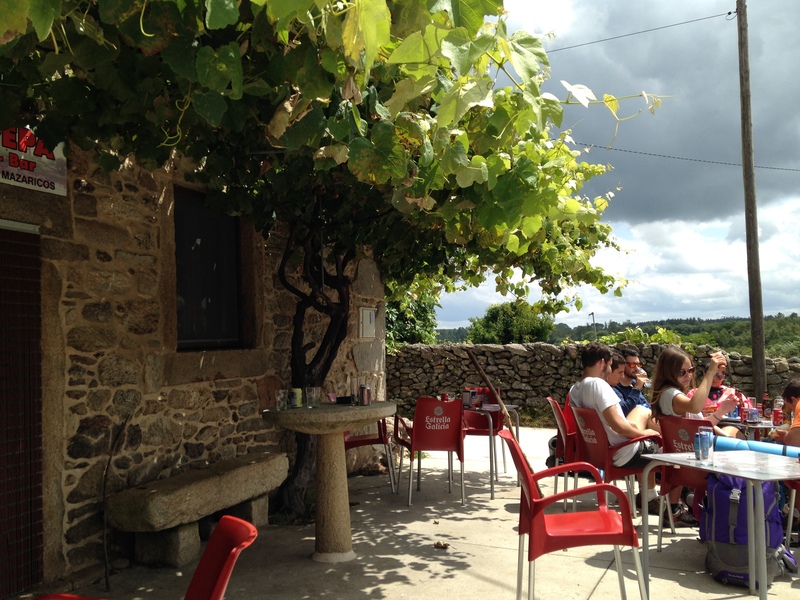 Already, today, the Camino gave me what I needed, more than what I needed. 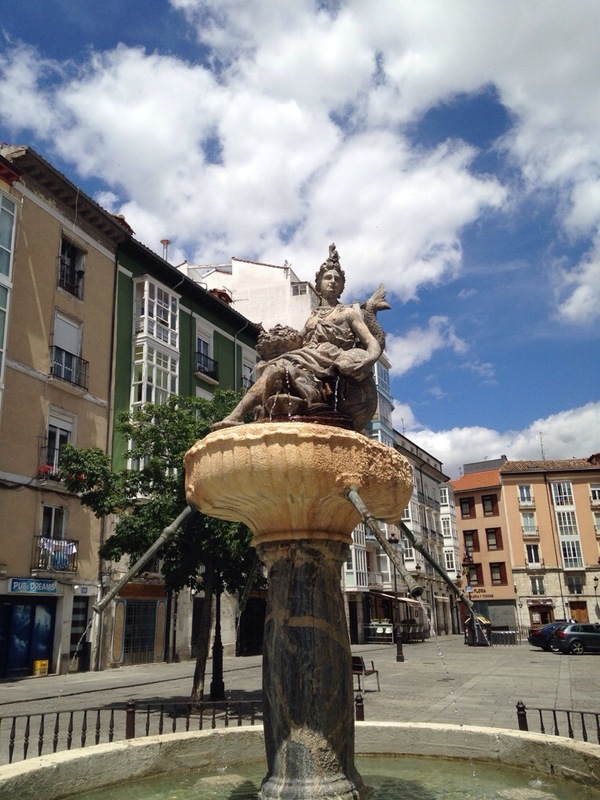 I had no guidebook to walk me into the city of Burgos, but I ended up with something better. An old man with a cane was waiting on a bench, and when I walked by he motioned for me to follow him, and took me and two Lithuanian girls to a scenic detour. 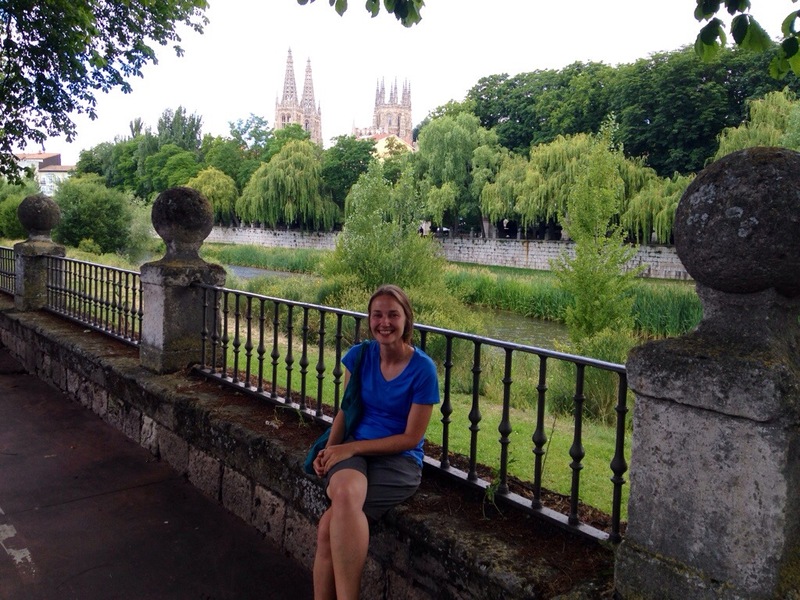 Our entire walk into Burgos- what many others referred to as the walk of hell- was through a beautiful park. As we approached the city another man explained exactly how to get to the cathedral and albergue and tourist information center. And as I waited in front of the small albergue for Mirra, another pilgrim sat next to me and told me how great the albergue was, then introduced me to the hospitalero (the man who runs the albergue). 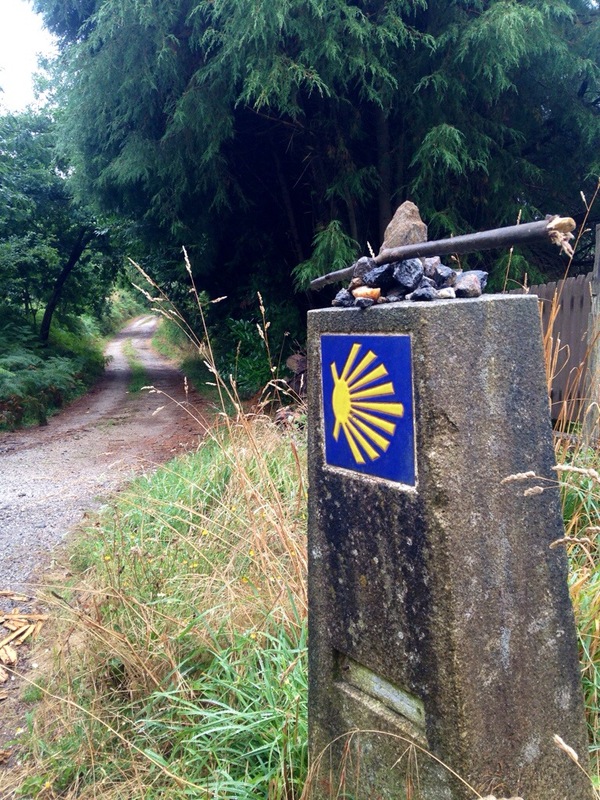 Some people call these Camino angels, and maybe that’s true. I’ve experienced this so much on the Camino: someone is there to help or be kind just when I need it. So I’m going to try to put my trust in the magic of the Camino. 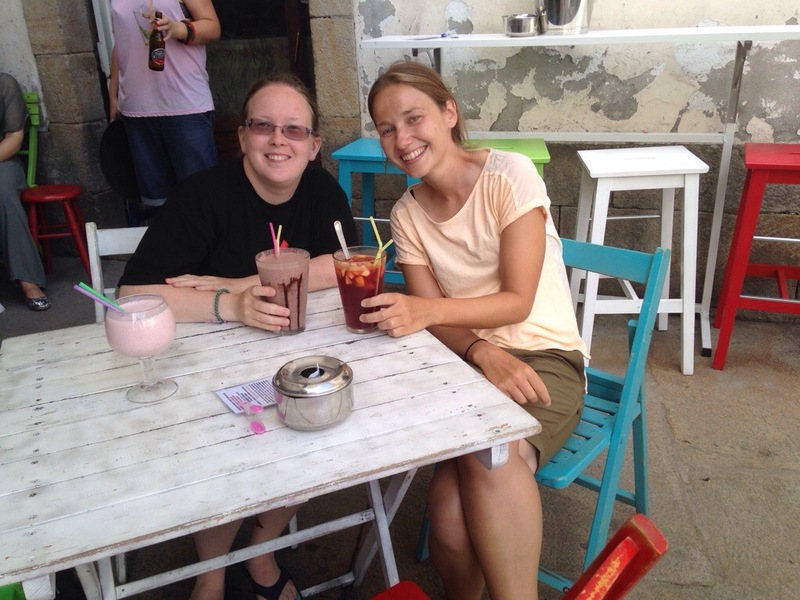 I’m saying goodbye to my best Camino friend, and even though I can’t imagine that the second part of this Camino could be any better than the first, I’m trusting that if I let myself see it, I’ll experience so much more magic. I’m in the kitchen of an albergue in Belorado, drinking hot tea and watching the rain fall outside. Sitting around the long table are the Italian family (with the two sweetest and well-mannered teenagers I’ve ever met), Susie, Helen, Mirra and Alfred (the Frenchman notorious for his snoring. Supposedly, people have been avoiding the albergues where he sleeps, or they ask to switch rooms. I’ve heard how wonderful of a man he is- during the day- and so far it’s true. He has a deep voice but is soft spoken, and he made a large pot of tea and instantly offered me some when I sat down). Besides Alfred, I know this group pretty well. I talked with Susie and Helen waiting for the bus in Bayonne, and I’ve walked/interacted with them for the past 10 days. I met the Italian family about 5 days ago in our albergue in Puente La Reina. The father is Italian and the mother is English, and our paths have crossed with them over and over. Three days ago I said goodbye to them, thinking that I wouldn’t see them again since Mirra and I were planning to do a short stage and get off track from the group. But we’ve learned that you can’t really plan or control things here, and maybe that’s for the best. Things- despite not going according to plan-are working out really well. In any case, we keep running into the Italian family and showing up in the same albergues, and it’s been wonderful to talk to them. I love the kids, and am so touched to see their kindness and care towards others. They were supposed to end their Camino today and take a bus to Burgos, but are staying just one more night. We joke about how tonight might be the ‘final goodbye’. Mirra and I have planned our walks together, though our actual walking is usually done separately. She will end her Camino in a few days, so for now, I’m enjoying her company: our conversations about this time in our lives, our pre/post siesta wine and tapas outings, cooking in the albergues, and switching off on who gets the bottom bunk. I wonder what my Camino will be like one week from now. Most of the people who are sitting around this table will be back to their normal lives, and most likely I will be walking with and talking to new friends. That’s both an amazing thing, and a bit of a sad thing. Yesterday’s walk felt wonderful (especially after my stormy mood the day before). The skies were clear and the day grew hot, but most of our walking was done before the heat of the day. 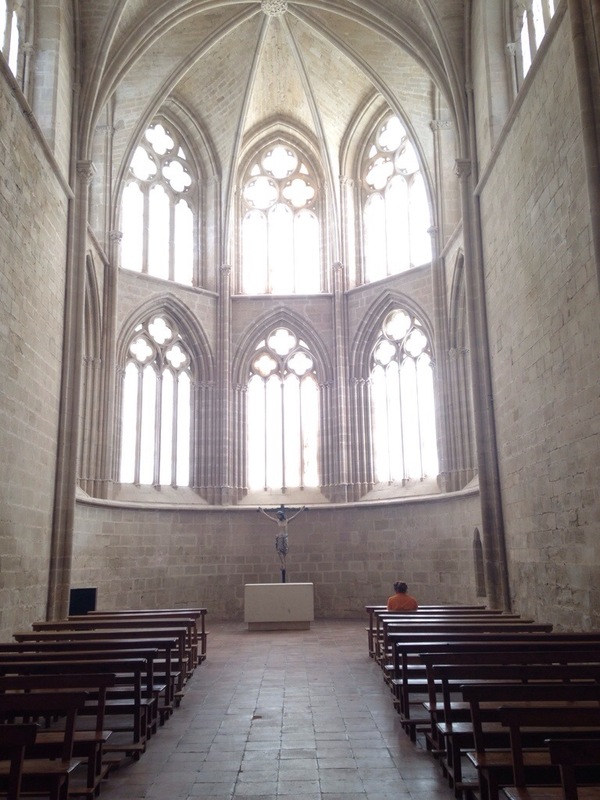 I walked about 30 km, a longer day because of a detour to see an abbey in Cannas. 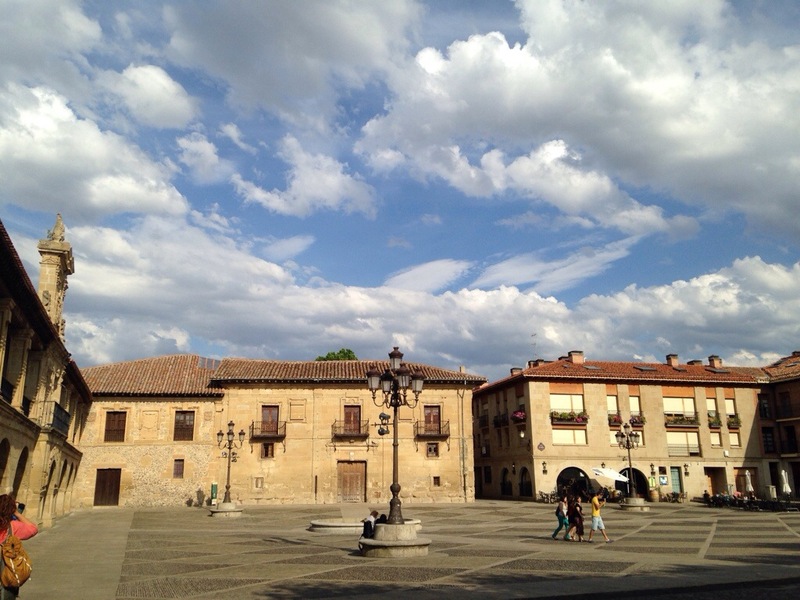 We ended in Santo Domingo, and it was probably one of my favorite places on the Camino so far. A small town but with plenty of bars and beautiful squares and a great church. The chicken church, as I (and many others), like to call it. There’s a legend about a pilgrim and a chicken and a miracle that dates back to the Middle Ages, and the story is long and interesting but way too much for me to write out at 10pm (which is a late night here). In any case, the church has been keeping live chickens since 1350 (I think they rotate every few weeks), and I’d heard about this church awhile ago and it was on my short list of Camino must-sees. And even though it cost 3 euros to go inside, it was wonderful to see some chickens and think about the power of belief and miracles. Everyone I loved was in my albergue last night, and it was totally unplanned. Mirra, John, Christy, Ibai and I had dinner together: an avocado, tomato and cucumber salad, bread and wine, lentils with mushrooms, cherries and chocolate for dessert. We sat outside in the courtyard until 10pm when the nuns chased us upstairs and told us to turn out the lights. I slept soundly, and for the first time on the Camino, was so comfortable that I wanted to stay in bed when my alarm went off in the morning. Today’s walk was also good. I’m feeling strong, and except for some slight knee pain, am doing really well physically. A 20 km day feels so short, and I usually just want to keep walking. Mirra and I stopped in a small town to try out a tiny albergue with only 10 beds and a communal meal. We were there by 10:30 and not a soul was around, but the sign on the albergue said ‘completo’. We didn’t believe it, so we waited there for nearly two hours. The day was windy and cool, but sunny while we waited, and we sat on the benches outside eating cherries and writing in our journals. Eventually a few other Pilgrims showed up, one called a number for the albergue to find out that there were, indeed, no beds available. We packed up to leave but then heard music, and from out of nowhere a dozen boys in costumes were dancing their way down the small streets with the entire village following behind in a procession. It was Santo Domingo day (he’d been born in this tiny town), and if we hadn’t waited for the albergue we’d never had seen the festivities. We walked on, and after another 9 km ended up in a town where most people were staying. We once again picked an albergue that had most of our favorite people, and now we’re sitting here quietly, listening to the rain and drinking tea. 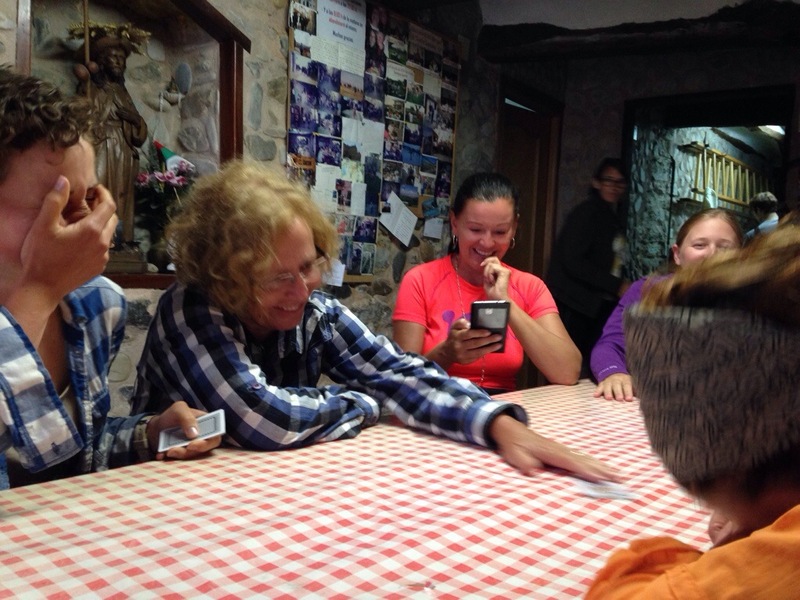 Two guys just joined us- one from Switzerland and another from Germany, Helen pulled out a deck of cards, and the Italian boy is explaining how to play a game called ‘killer’. Time to go. Today started out so well, so I’m not sure when it took a turn for the worse. I woke up after a good night’s sleep in the parochial albergue; somehow, in a large room of 35 people in bunk beds, no one snored. No one even tossed and turned, or maybe I was just sleeping very soundly. 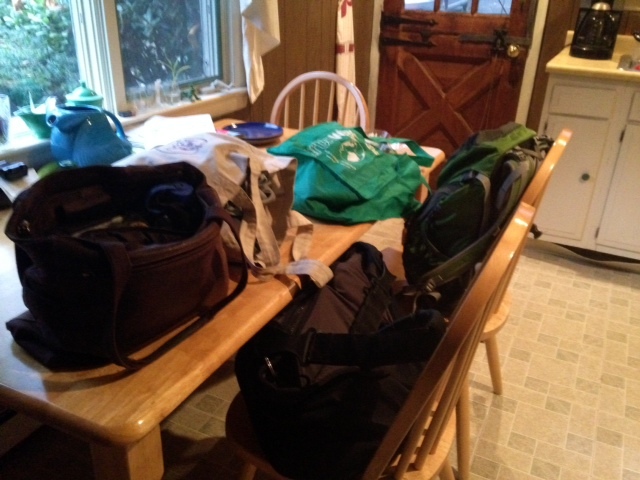 Once I woke up and packed most of my things, I went upstairs to the dining room where breakfast was spread out. The table was set with plates of toasted bread, strawberry and apricot jam, butter, crackers and cookies. There were large Italian espresso makers boiling coffee on the stovetop, with milk and sugar containers next to the mugs. 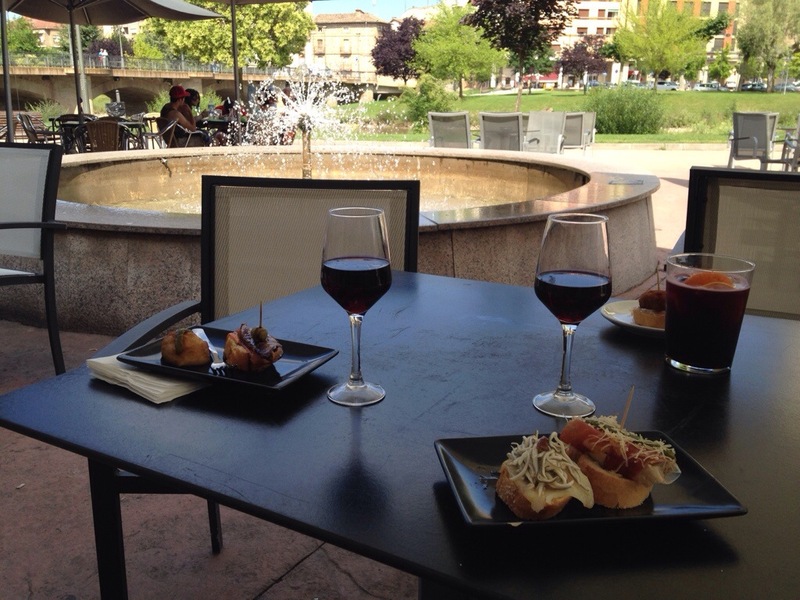 It was such a treat to start the day with fresh coffee, and as soon as I walked into the streets of Logrono, I felt so good: my legs were strong and my feet felt great. I passed by a bar where I saw bins of fresh bread; I bought a loaf and said hi to a few other pilgrims I’d recognized along the way. The man spoke only Spanish so I couldn’t understand what he was trying to tell me, but then he opened a plastic bag and offered me a cookie. I walked through Logrono eating the cookie, and it seemed as if every time I got to an intersection and couldn’t figure out the way, someone would point me in the right direction. But then things went downhill, although it was mostly just my attitude. 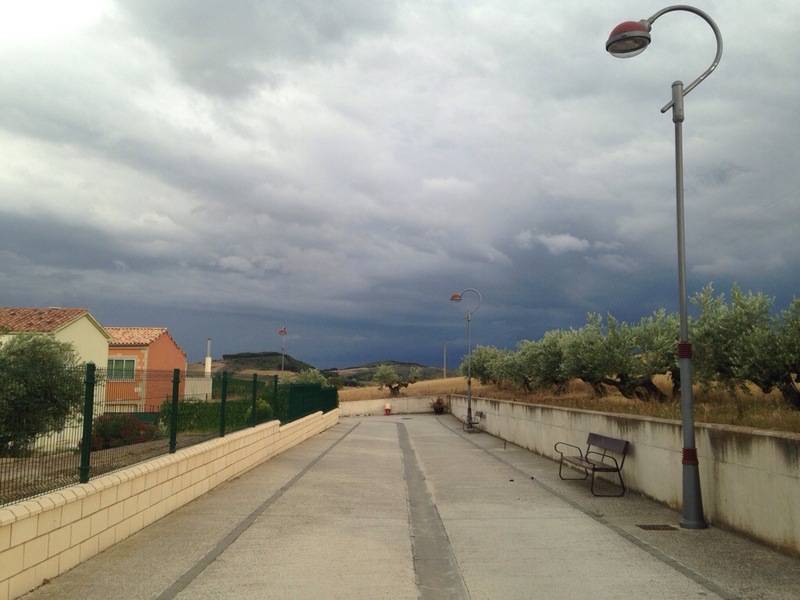 Dark clouds had been gathering and soon it started to rain (the first time I had to walk in rain so far on the Camino); I was stuck in a cluster of Pilgrims (I would move ahead, then stop to drink water or add/take off a layer, and others would catch up); the walking felt hard. Too humid in the rain, too cold without a jacket. I was uncomfortable. I was dragging. And I just couldn’t get away from everyone. Sometimes I don’t mind walking with others, but today it just felt like there were so many people around. I wanted to feel like the path was more spread out; I like walking and only seeing a few people ahead or behind me (or better yet, no one). I found a large tree and a big pile of rocks to duck behind to use the bathroom; I couldn’t have been more than two minutes but when I came out from behind the tree, it was like a tour bus had dropped off a few dozen people. I have no idea where they came from, but there were pilgrims all around, walking with daypacks. I finally made it to the town where Mira and I had been thinking about staying; it was small, with a few streets and two bars and one albergue. I passed one bar and looked inside to see about a dozen people I knew. Then I walked up the street to the other bar where some locals were hanging out. I got a coke, sat outside at a table, and started writing in my journal. It’s a strange contrast here, to be on a pilgrimage and want to experience solitude and space, but to also be part of this large community that is so welcoming and warm. I’ve loved the people I’ve met, and part of me wants to follow the typical stages and stay where I know everyone will be. It is so wonderful to walk into an albergue and be greeted with smiles and even cheers. But today I just couldn’t shake the feeling that I wanted to be apart from everyone. I was sitting at the bar, thinking about this, when a beautiful Italian boy pulled up on a bicycle (I think stuff like this only happens in the movies, and on the Camino). He took off his helmet and set his things at a table, then turned to me and gave me a big smile and an “Hola! Buenos dias!’ We each sat in silence for awhile, and then started talking. He must have been young- in his early 20’s- with dark curly hair and clear blue eyes. We talked all about the Camino and the experience and where we were from and what we do and then quickly, like things usually go here, we talked about deeper stuff. About the same things I’d just been writing about: solitude versus community. Making connections and then losing the people you make connections with. My day turned around after this. I was still a little grumpy and craving some time to myself, but I was able to drop most of my negative attitude. The clouds cleared away and we walked on a path that looked out to a panoramic view of the mountains. I listened to music, and then walked with Susie and Mira into Najera. We decided to splurge and stay at a private albergue, in a room with only 2 bunk beds (a good choice, because we later saw the municipal albergue with 90 beds in one room, many of them pushed together. And rumor had it that there were at least 6 people snoring loudly that night). We went out for wine and tapas, then did some grocery shopping. Before making a big salad in the albergue kitchen, we took a bottle of wine and a bag of potato chips down to the banks of the river, where we stretched out on the grass and talked about life. I continue to be amazed at the potential for meaningful conversation on this trip, and how easily people open up about their lives and the things that they struggle with. I thought about how I’d been tempted to be alone all day: to walk by myself and to stay in the tiny village and to go off and write and do my own thing. And if I’d chosen to spend my day that way, alone, it would have been okay. But sitting with Mira and Susie, drinking an amazing bottle of La Rioja wine, hearing incredible life stories… that felt right. And it made me think about what the Italian boy said: that even if the connections are fleeting, the encounters are beautiful.